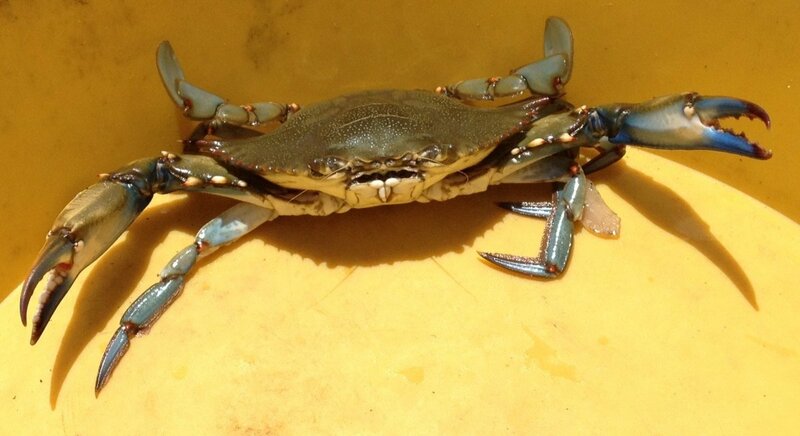 Gordon has been sea fishing and cooking since childhood. 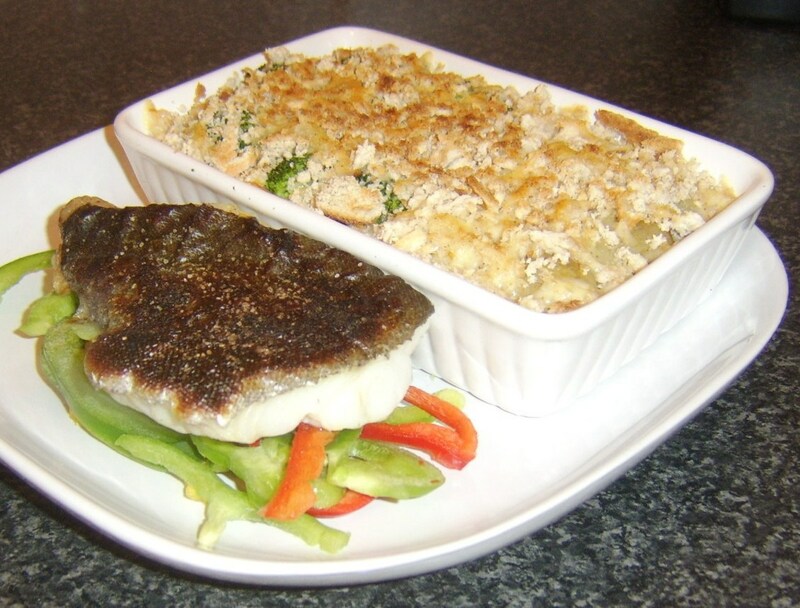 He loves coming up with tasty ways of cooking his fresh catch when he gets home. 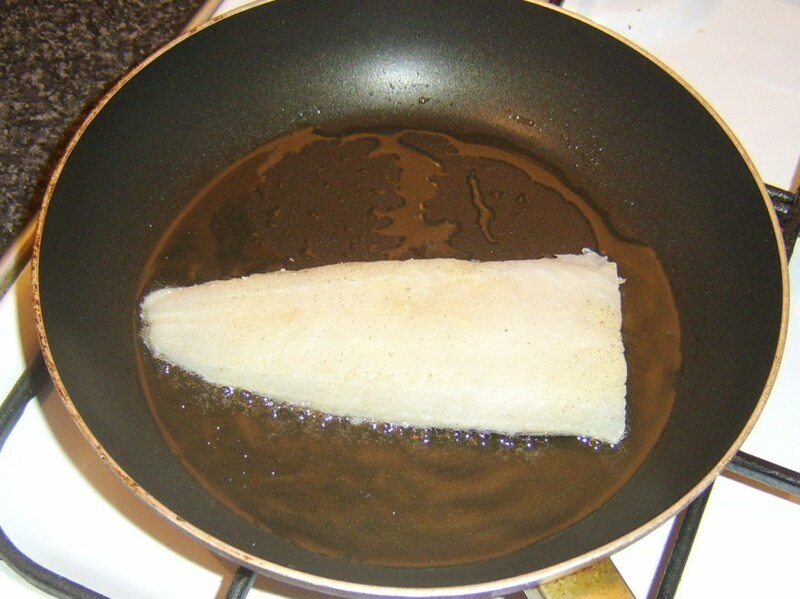 Pollack (sometimes known as pollock or lythe) is a firm fleshed, white fish from the same wider genetic family as the Atlantic cod. 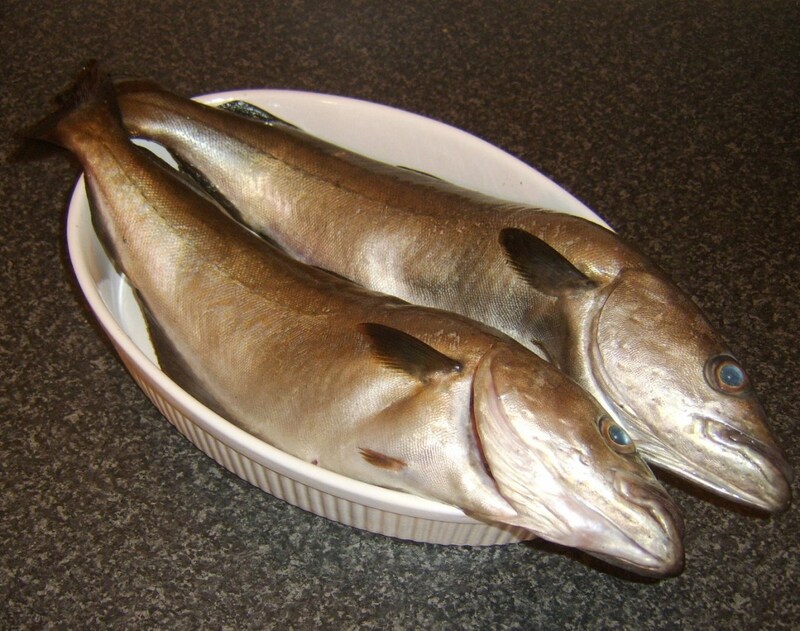 Although very similar to its cousin in both texture and taste, it remains hugely under-rated as an eating fish. 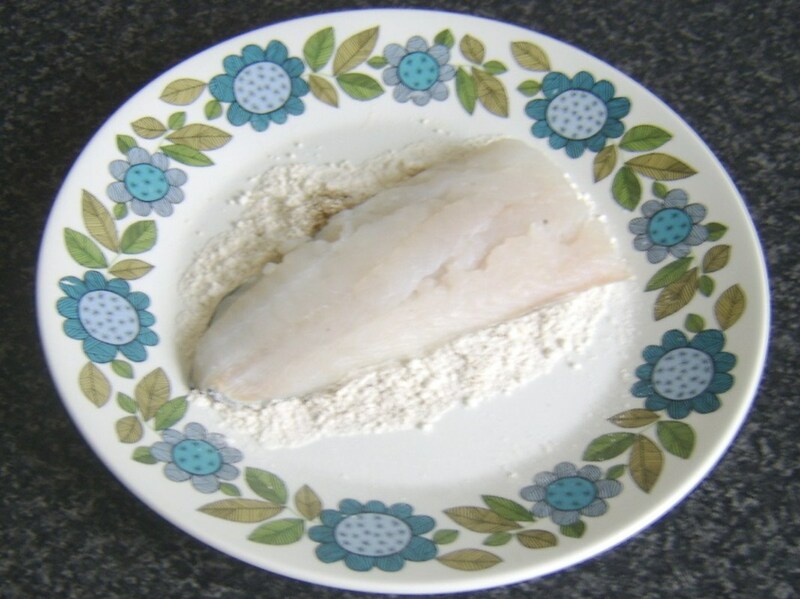 This is a great shame as pollack is presently deemed to be sustainable (unlike the cod), is considerably cheaper to buy, and can be used equally well in any given recipe which calls for cod. 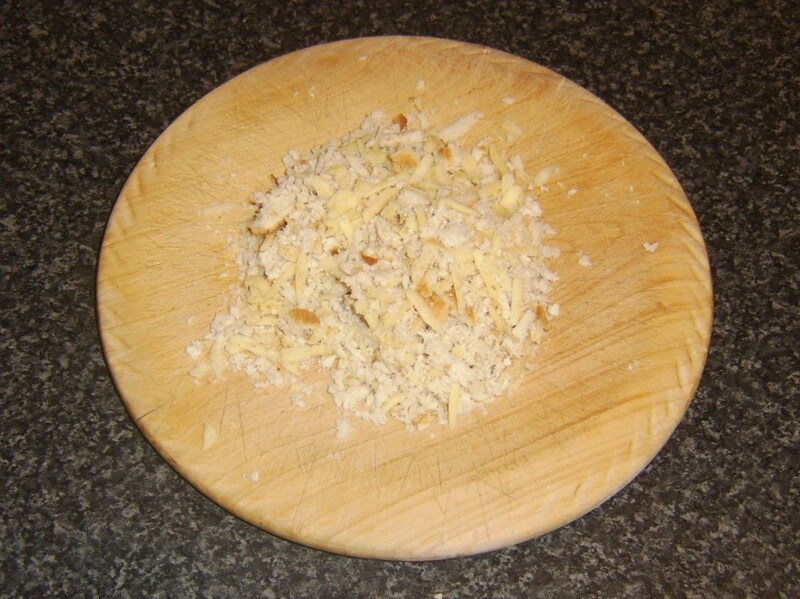 This page is intended as a guide to preparing pollack for cooking, and features fabulous and tasty recipes which anyone can prepare at home. 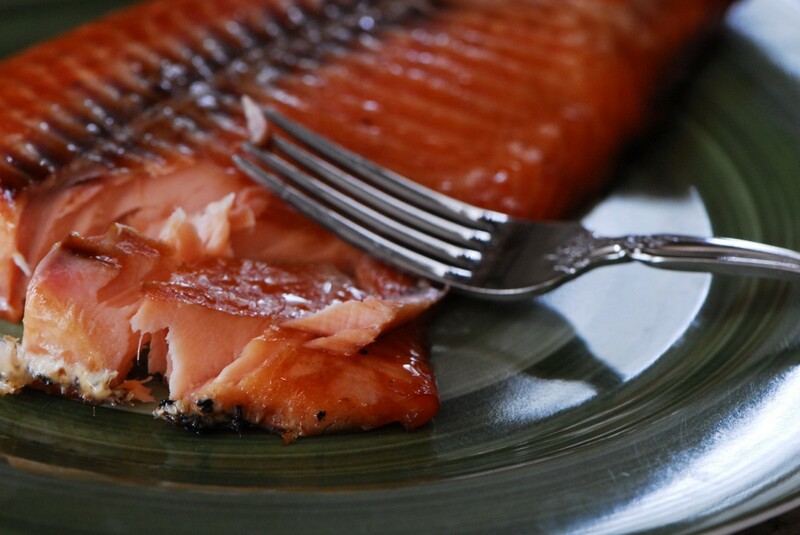 The recipes on this page were all prepared from two fresh pollack, rod and line-caught. 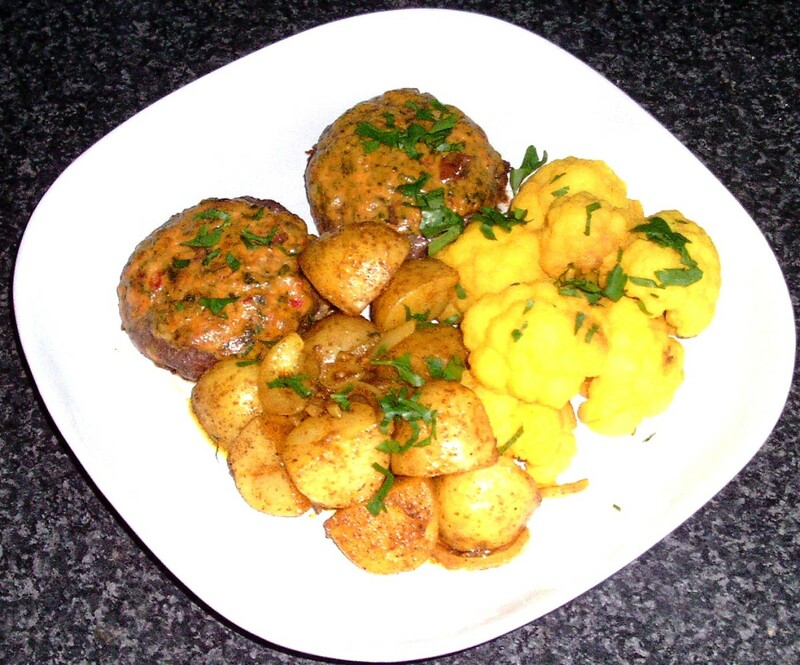 Smaller pollack can be delicious simply gutted and cooked whole in the oven in tinfoil, perhaps stuffed with some lemon, onion and herbs. 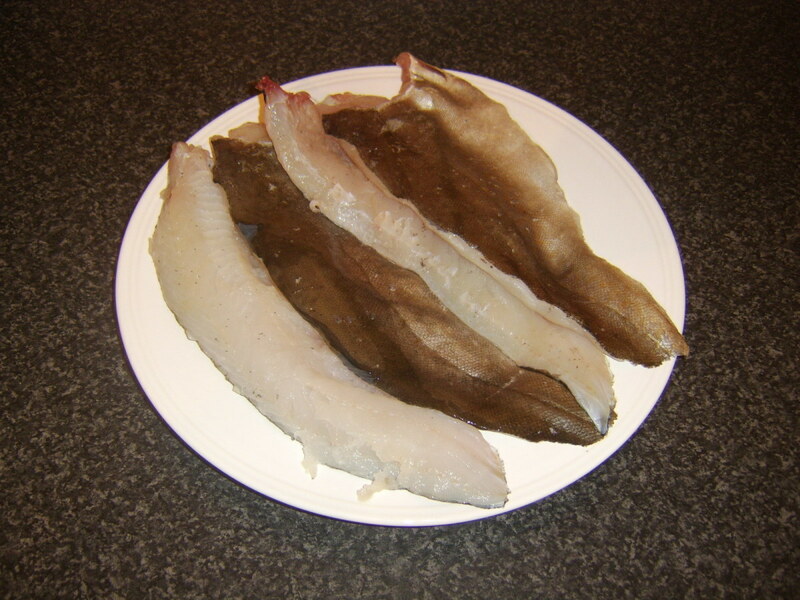 When you have even decent-sized fish, however, your best option is usually to fillet them (maybe chopping the fillets into more than one portion). In this instance, the guts were still in the fish when they were filleted as the fish were only about three hours out of the water. Don't leave them ungutted much longer than this, though, as the guts do speed up the deterioration process. 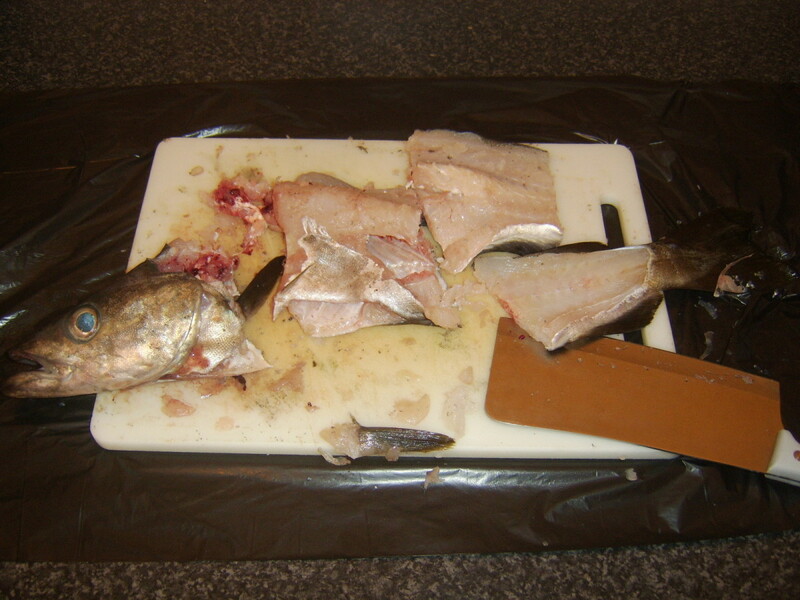 In order to fillet pollack you will need a chopping board and a very sharp, dedicated filleting knife. Lay the pollack on its side with the head nearest your weaker hand and the belly nearest to you. Make a deep, semi-circular cut around the head and behind the pectoral (head) fin all the way through to the backbone. 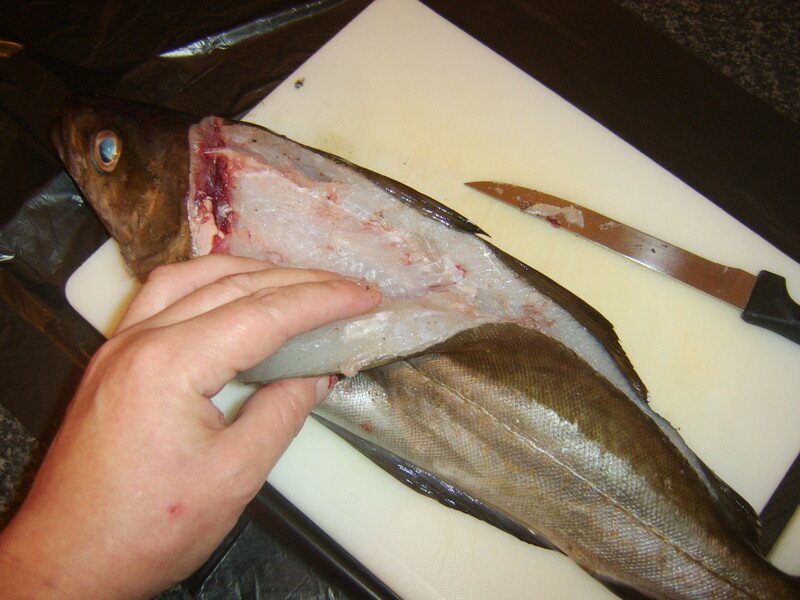 Hold the fish steady by the head and make a cut all the way along the backbone on the near side of the dorsal fins. 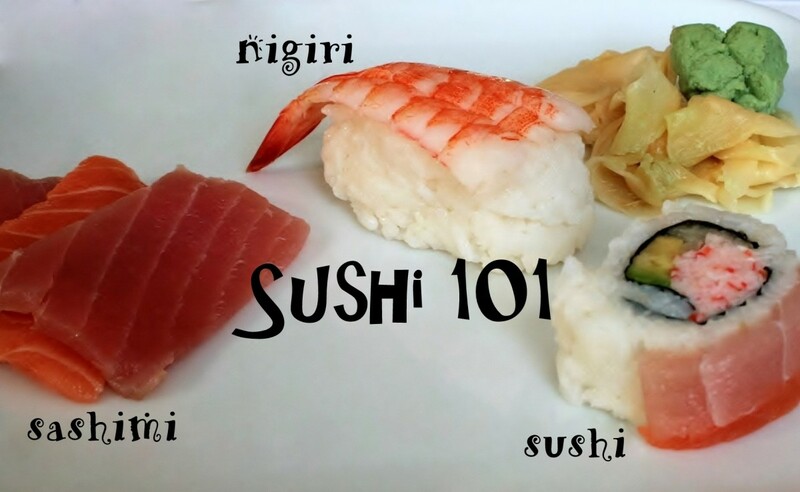 It is imperative when filleting a fish that you move the knife in one direction only (from head to tail) and do not employ any form of sawing motion. This would surely destroy the delicate flesh. Bearing this in mind, begin slicing through the flesh over the ribcage at the head end of the body, using the bones as guides, until you reach the belly and start to free the first fillet. Take your time and work along the fish until you reach the end of the ribcage. You can then slide the knife right under the fillet from belly to back and slice off the fillet all the way to the tail. The process is exactly the same for removing the second fillet from the pollack. 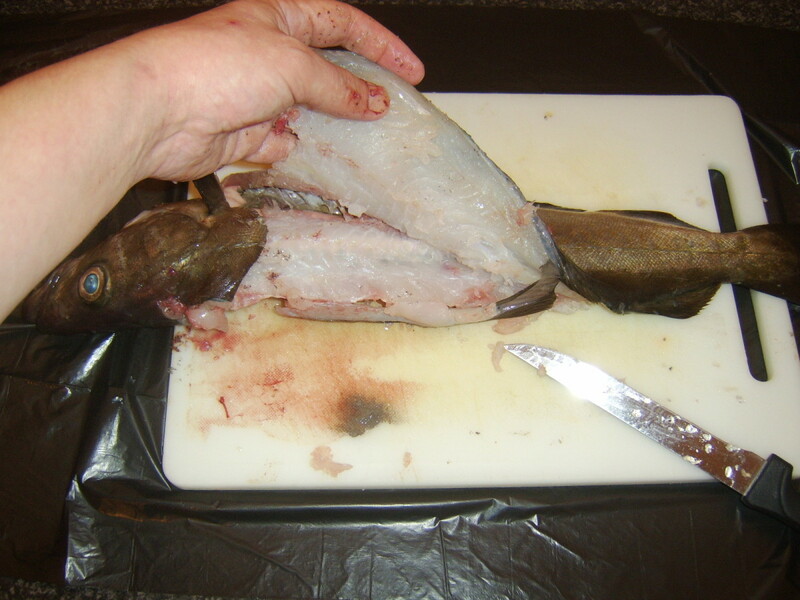 When you have removed the two fillets, pull the guts free and discard them. 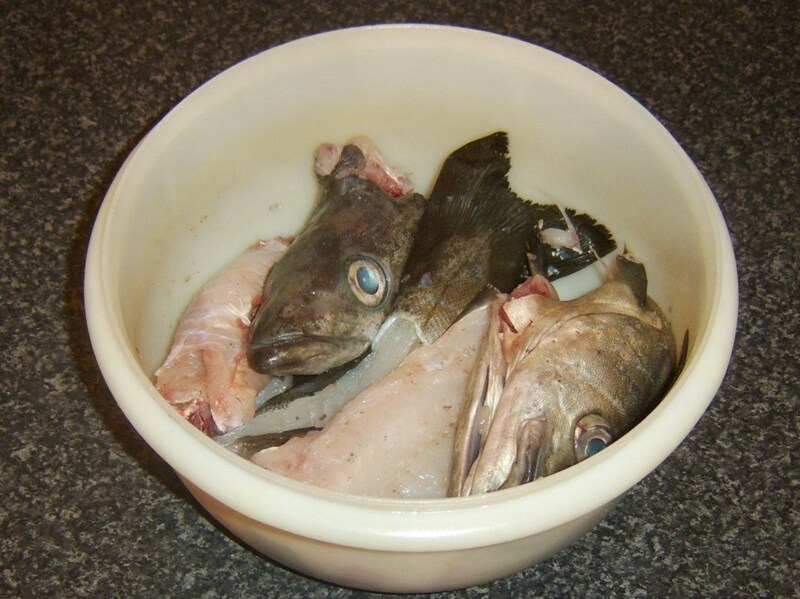 The bones and the head should then be chopped in to large pieces and used to make fish stock. 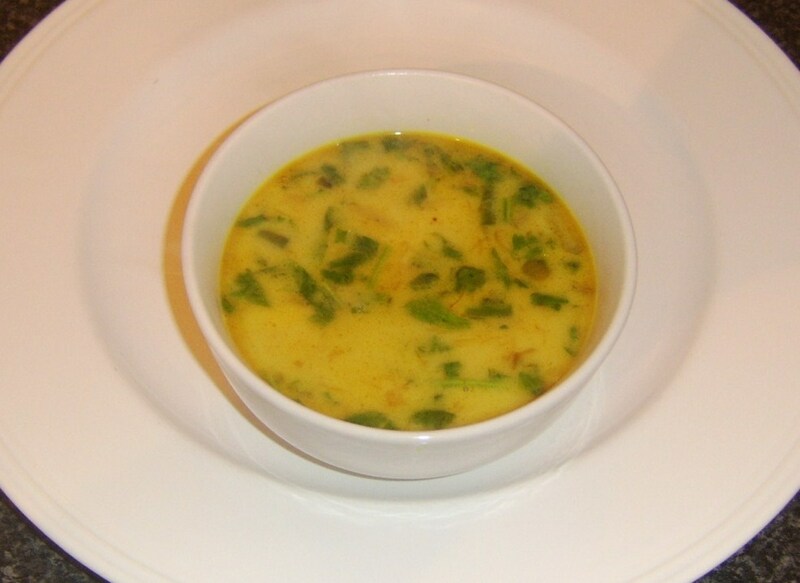 Stock made in this way is used in one of the recipes on this page. 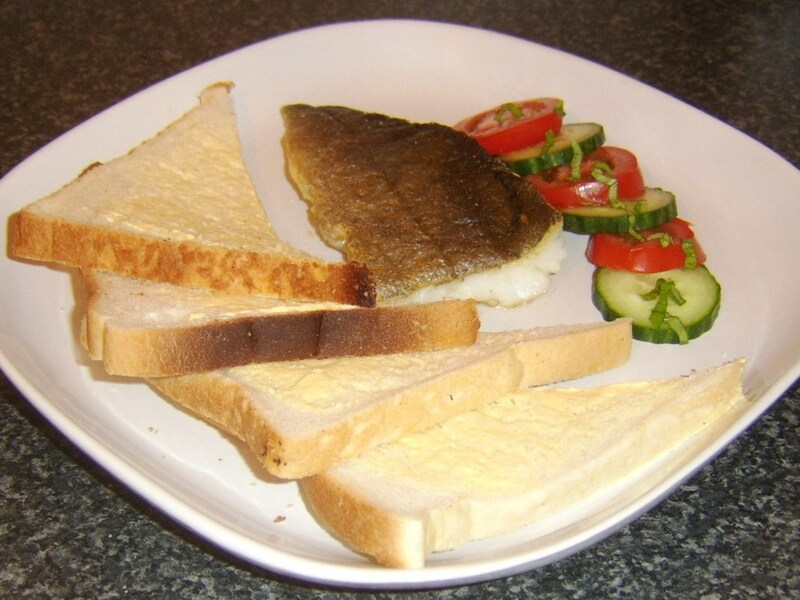 There is little doubt that most types of fish are most enjoyed when cooked in the simplest of fashions. 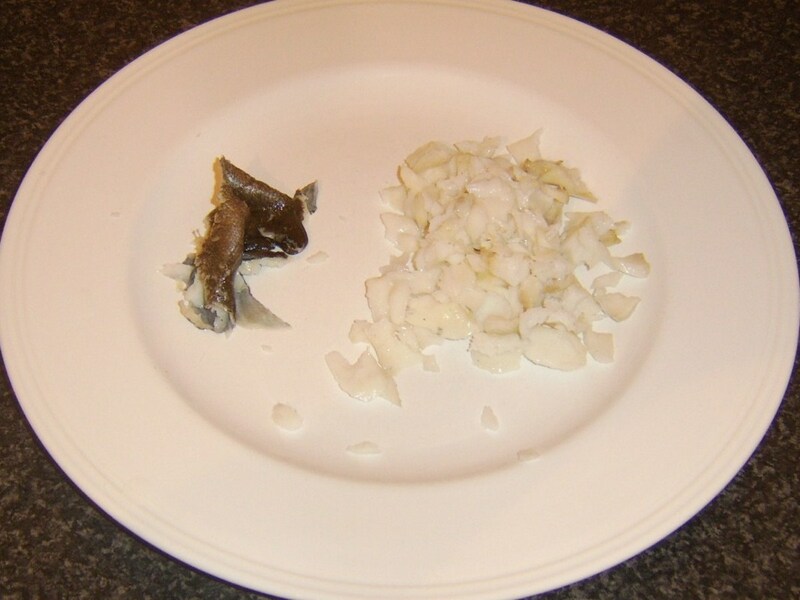 Particularly if you have never tasted pollack before, you may want to try this simple idea as your first recipe in order to taste the fish properly before you start experimenting. 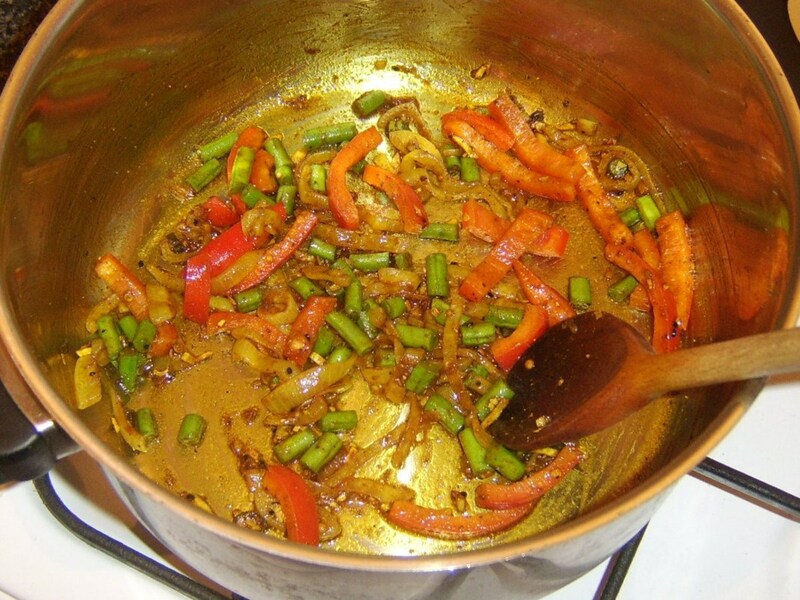 Put the oil in a non-stick frying pan and bring it up to a medium-to-high heat. 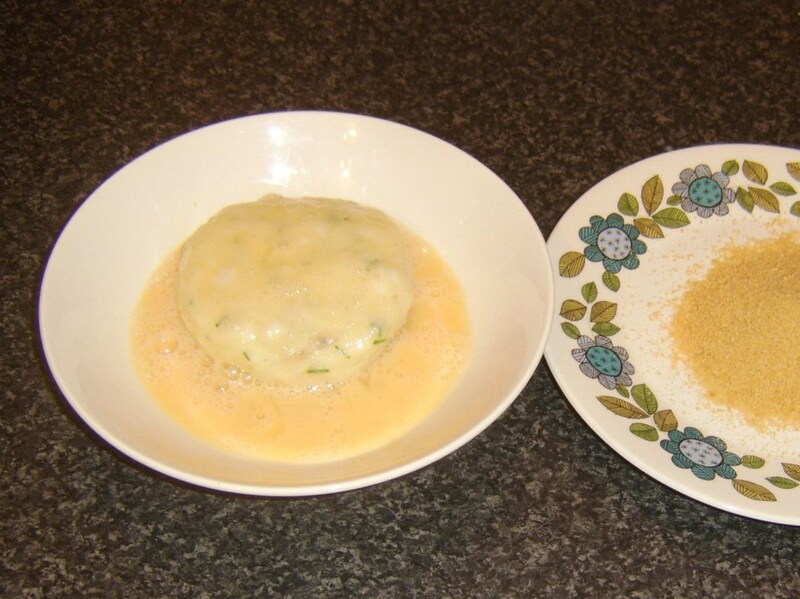 Put the flour on a plate and season with salt and pepper. 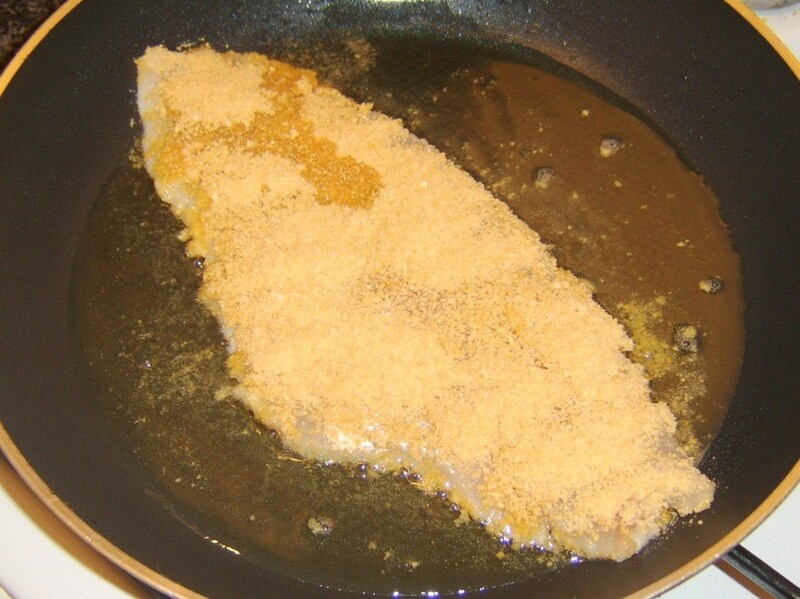 Pat the pollack fillet in the flour on its skin-side only and lay it in the pan skin-side down. Keep the heat level above medium as the idea in the early stages of cooking is to crisp up the skin. The skin will protect the delicate flesh. When you can see the pollack is cooked most of the way through, turn the heat under the pan down to minimum. Carefully turn the fillet on to its flesh side with a spatula and leave for one more minute to complete cooking. 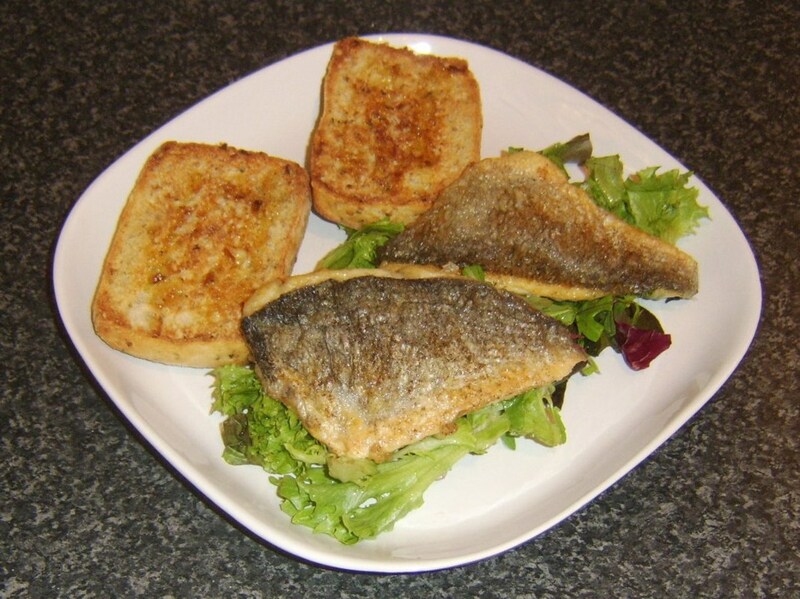 Butter the bread and lay it on a plate with the simple salad. Lift the pollack fillet on to the plate. The skin of the fillet, nicely crisped, should easily pull free in one piece. 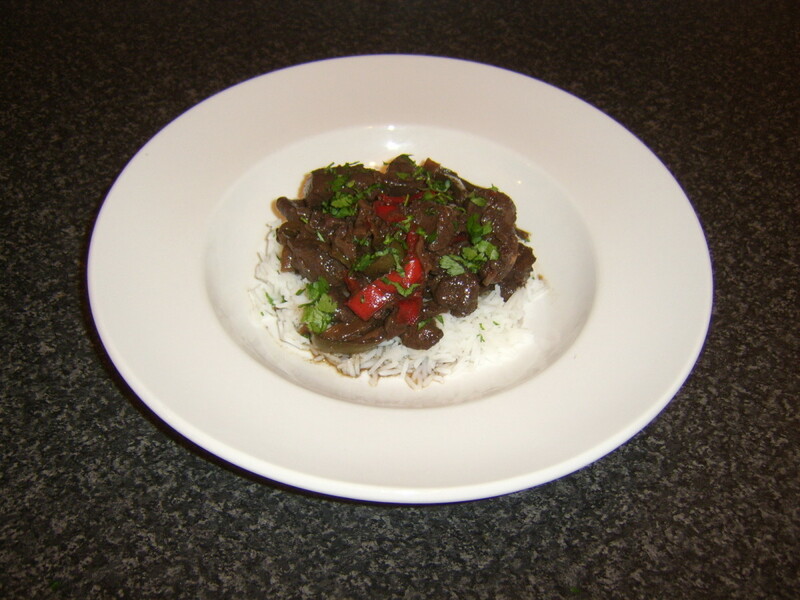 The pollack fillet in this recipe is cooked exactly the same way as in the recipe above. 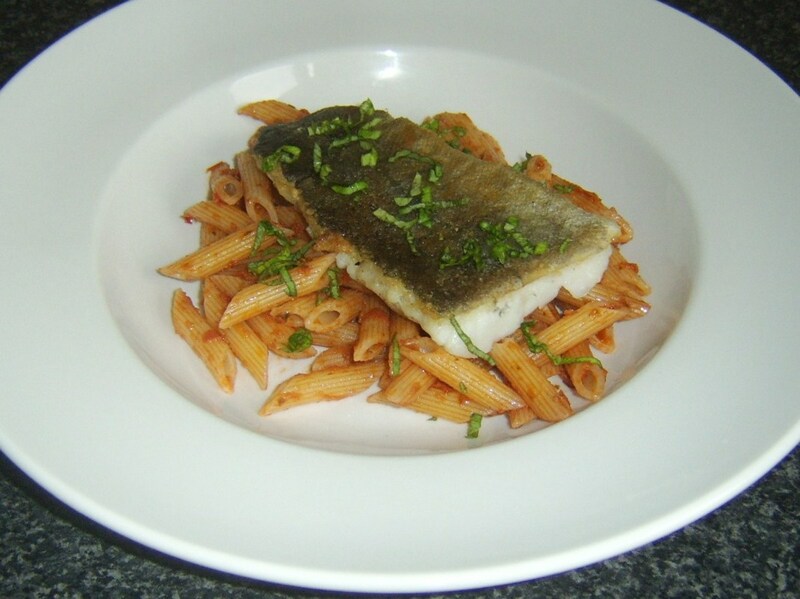 The natural flavours of the fish still come to the fore, but the accompaniment is a bit more robust. Instead of the sun dried tomato pesto used here, you could also use traditional basil pesto or even tomato sauce designed for pasta. Bring a deep pot of heavily salted water to a boil. 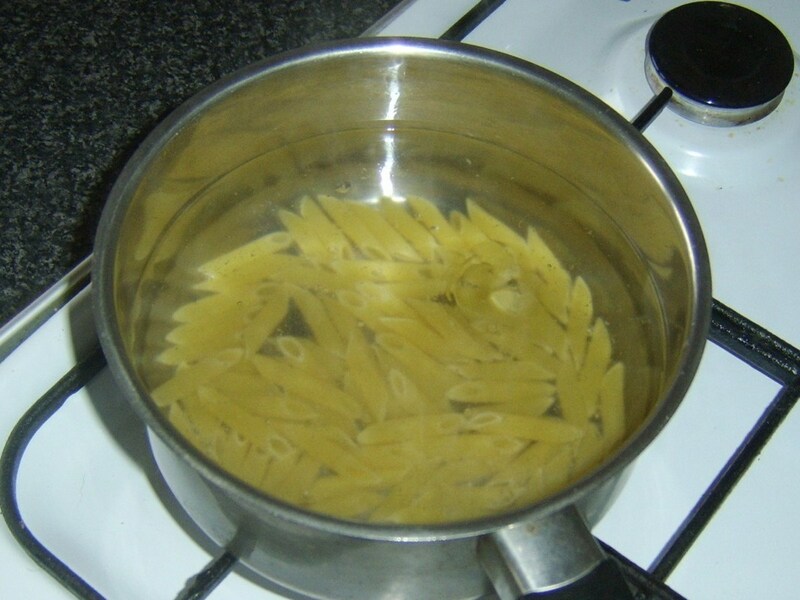 Add the penne pasta, stir well, and bring the water back to a simmer for ten minutes. 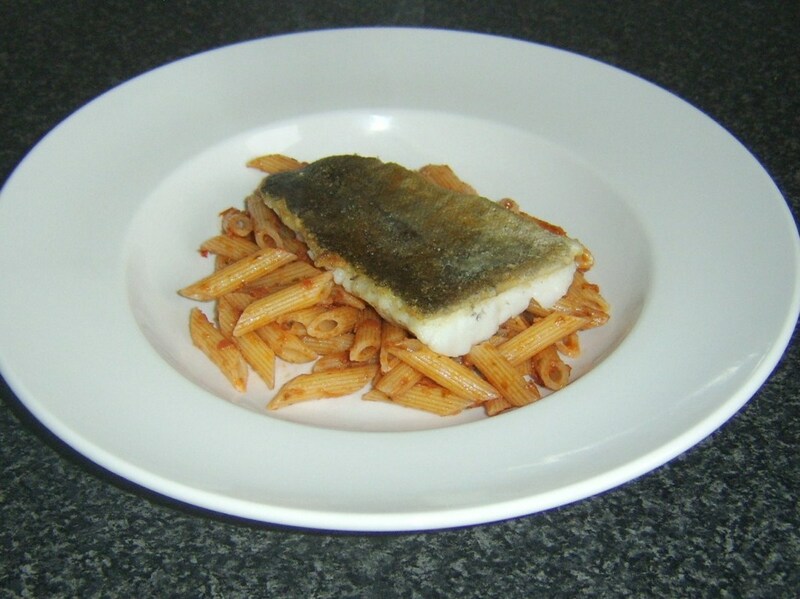 Cook the pollack fillet exactly as described in the recipe above during the latter part of the pasta's cooking time. 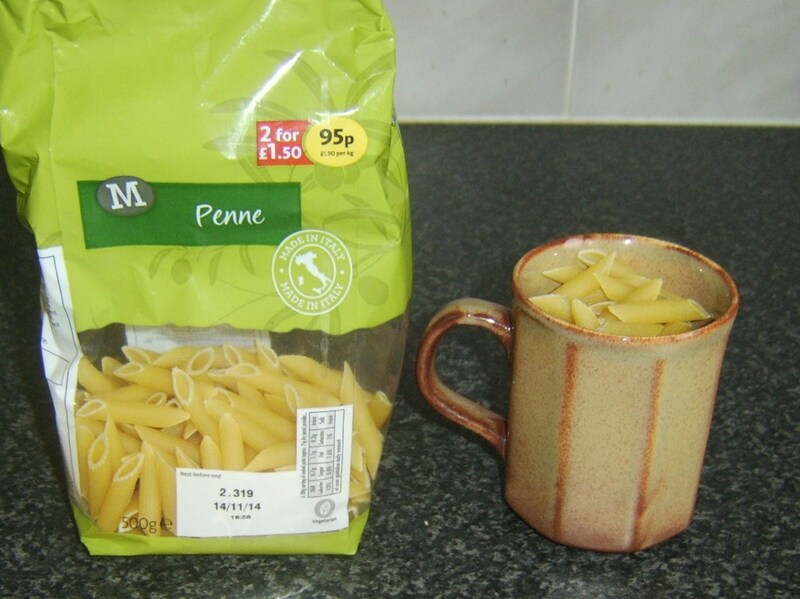 Drain the pasta well and return it to the empty pot. 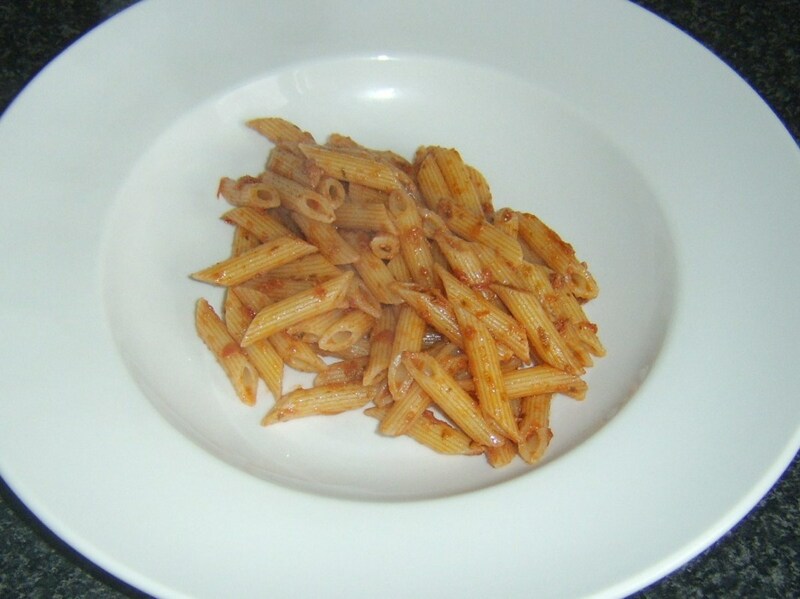 Spoon in the sun dried tomato pesto and gently stir it through the pasta. 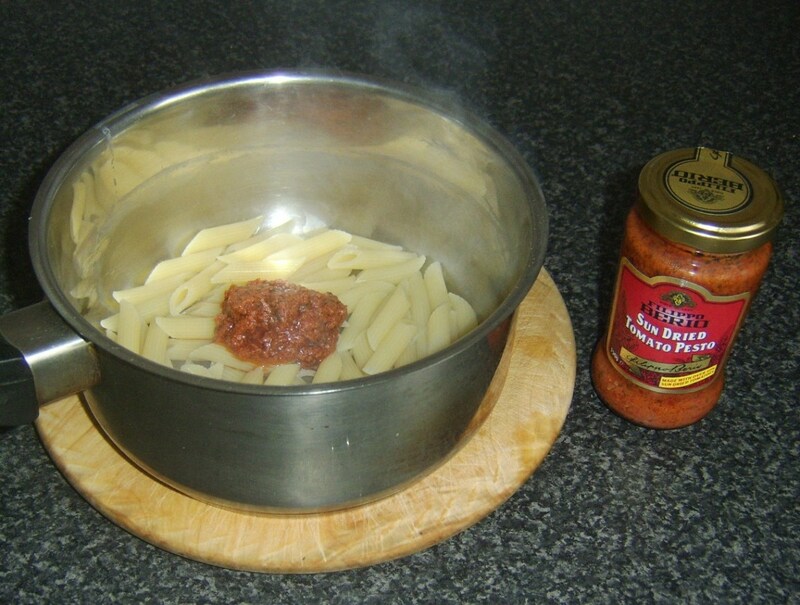 Spoon the pasta into the base of a deep plate to act as a serving bed for the pollack. Lay the pollack fillet on top, skin side up. Garnish with the basil before serving. 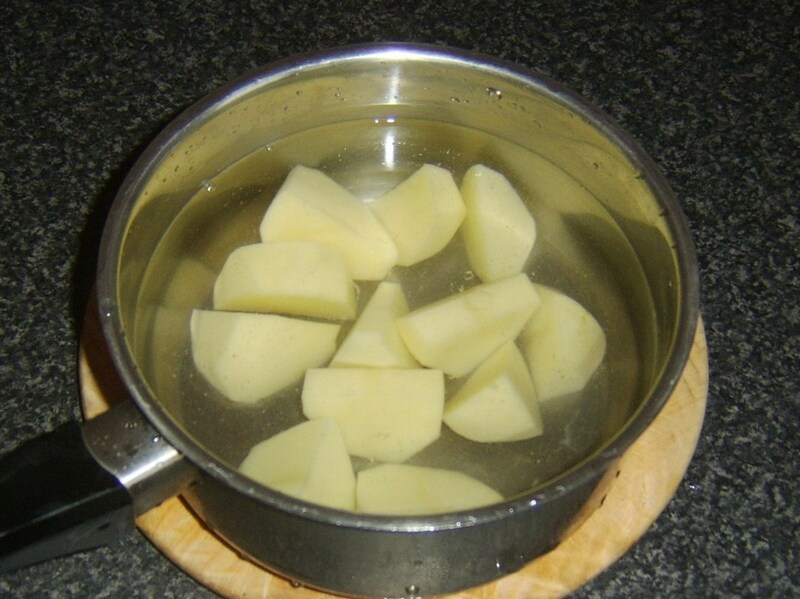 Simmer the unpeeled potatoes in salted water until softened—approximately half an hour. 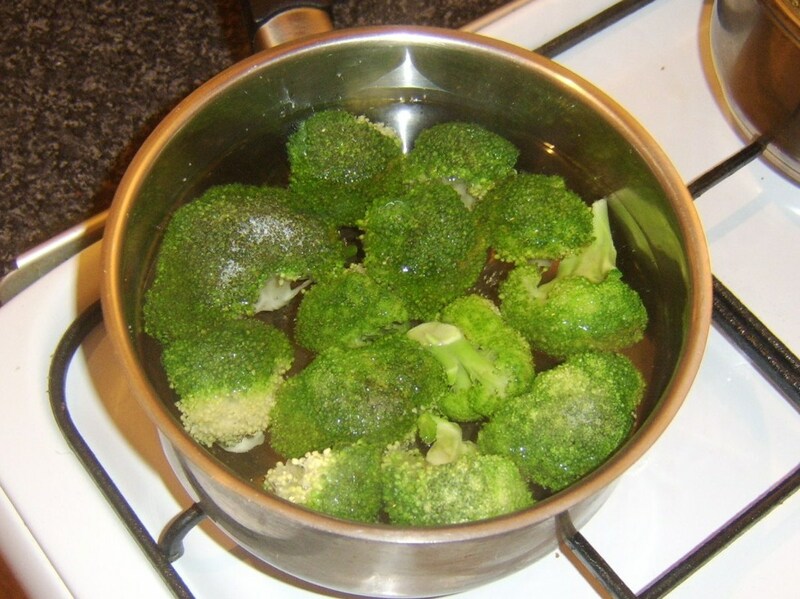 Simmer the broccoli in a similar way for ten minutes in a separate pot of water. Drain both through a colander. Put your grill/broiler on to reach a high heat. 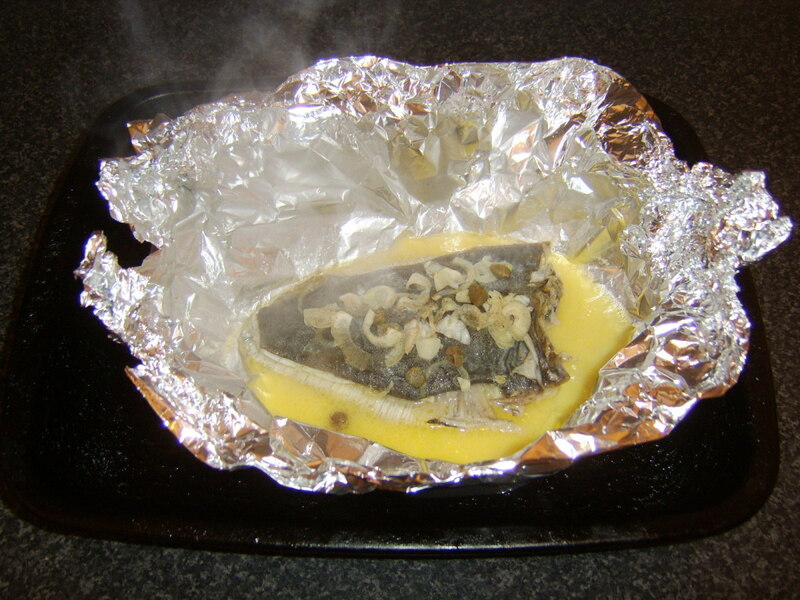 Cover a grilling tray with foil and lightly oil. Season the pollack fillet with salt and pepper and lay it flesh side down on the foil. Lightly oil the skin side. Grill the fillet until the skin is blistered and darkened and the flesh is perfectly cooked. 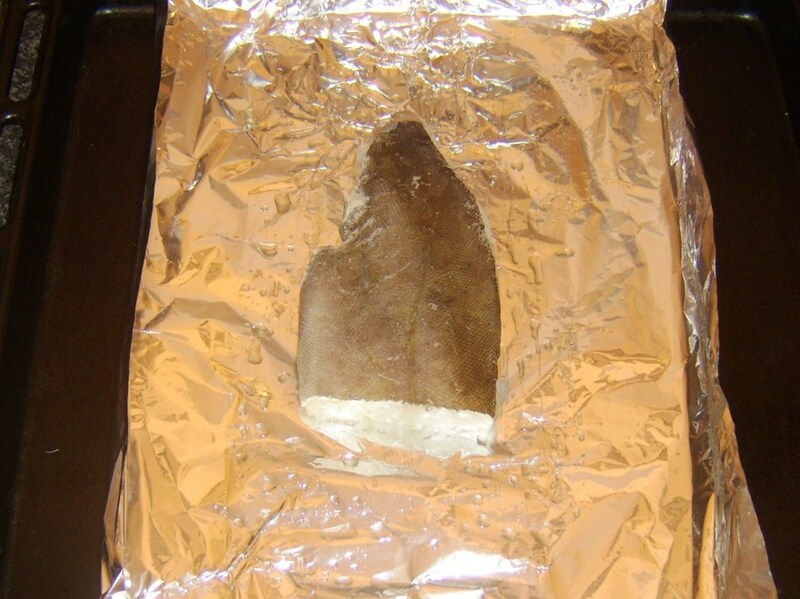 This will take roughly three minutes, depending upon the thickness of the fillet. 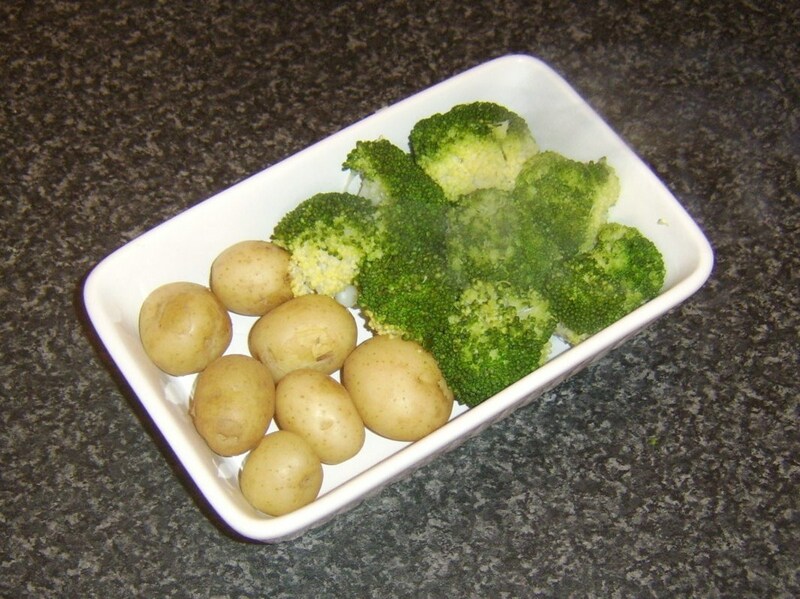 Lay the potatoes in one half of an ovenproof dish and the broccoli florets in the other. 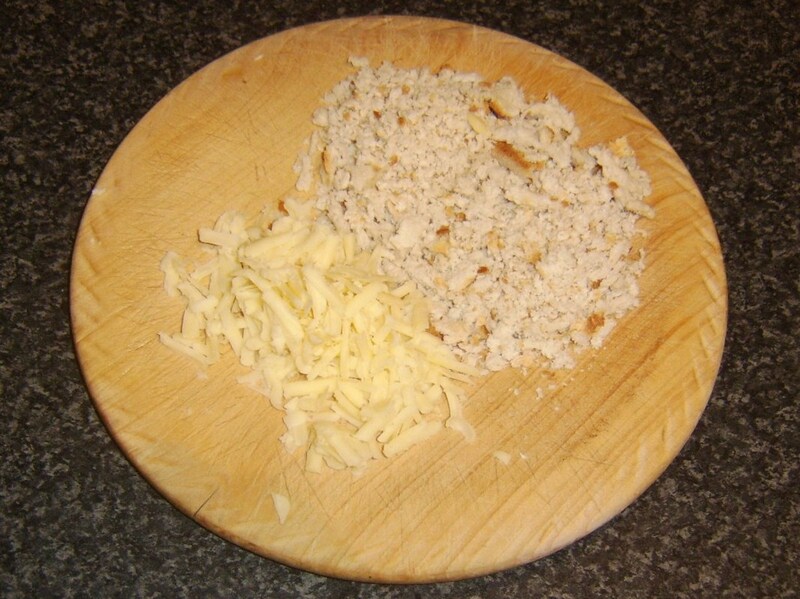 Combine the breadcrumbs and cheese, and season both with black pepper. Scatter evenly over the potatoes and broccoli. 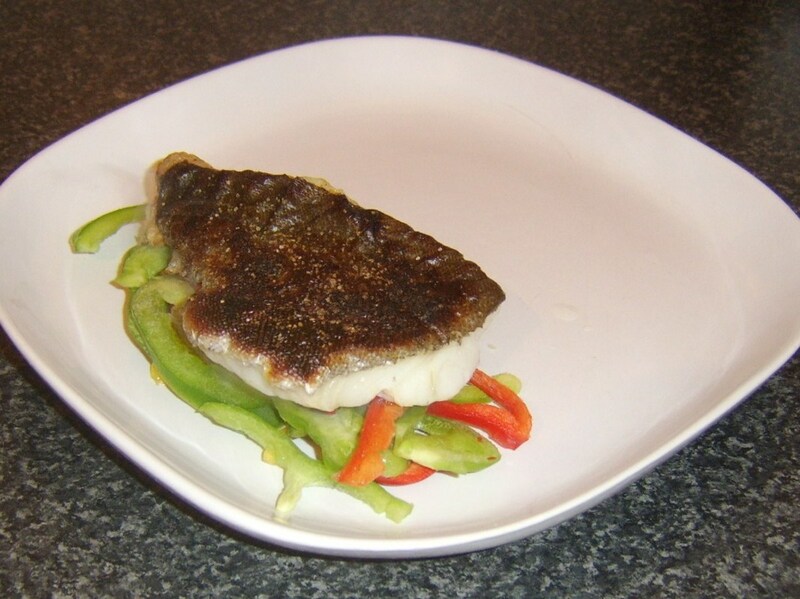 The bell pepper slices should be arranged on a plate as a bed for the pollack fillet. 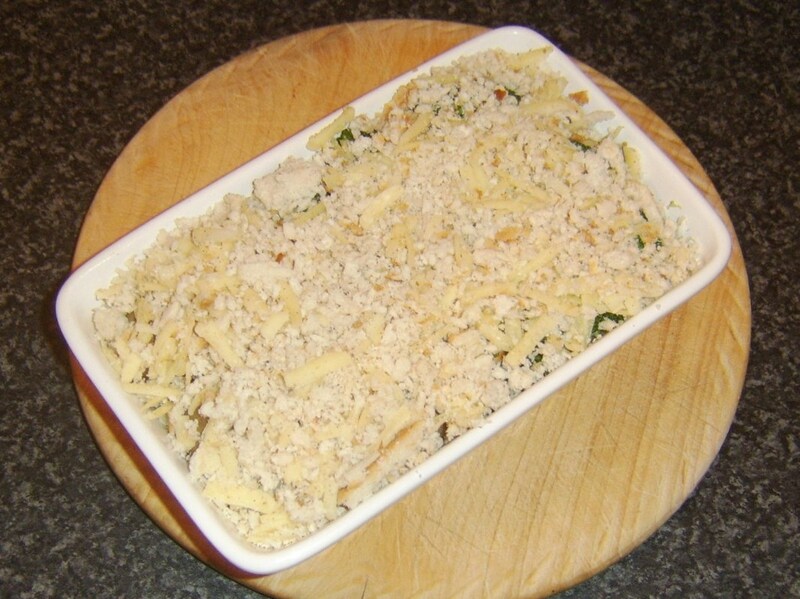 Put the vegetables under the grill for a minute or so, long enough to melt the cheese and brown the breadcrumbs. 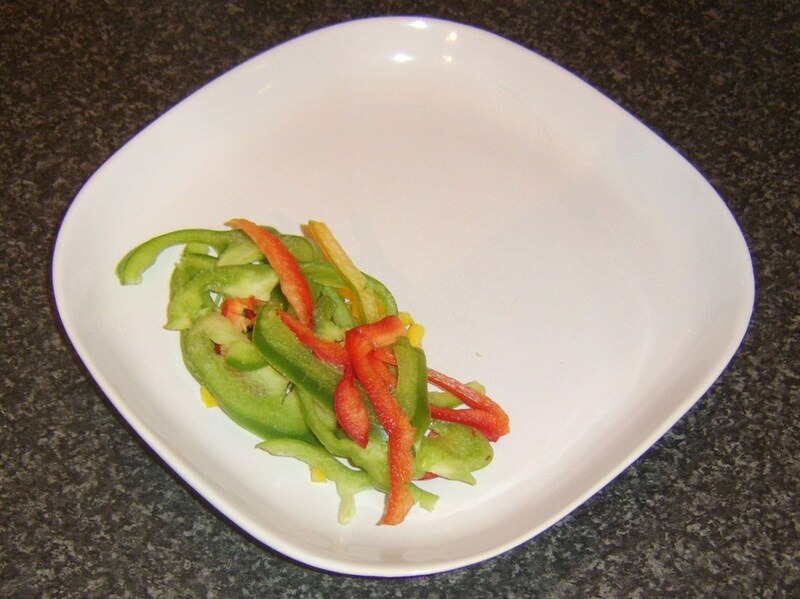 Serve the pollack fillet on the peppers with the crusted vegetables alongside. 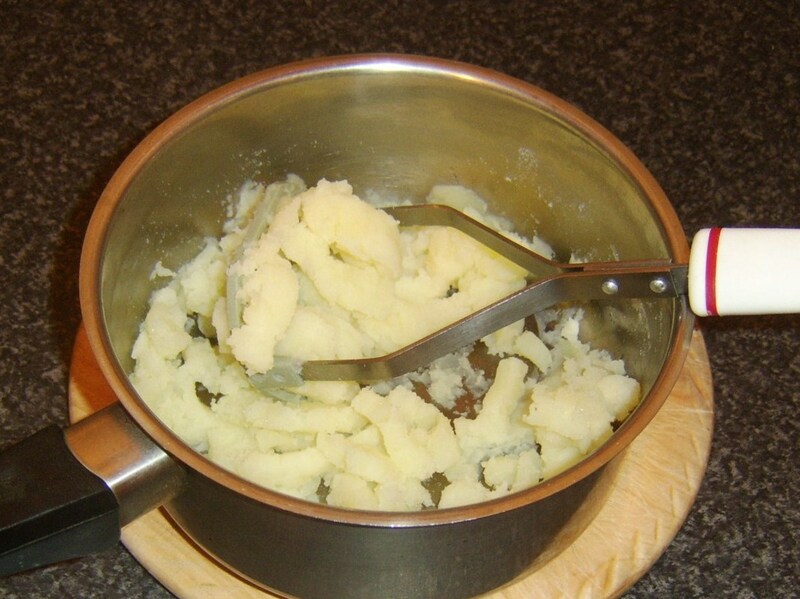 Peel and roughly chop the potatoes, and then add them to a pot of salted water. 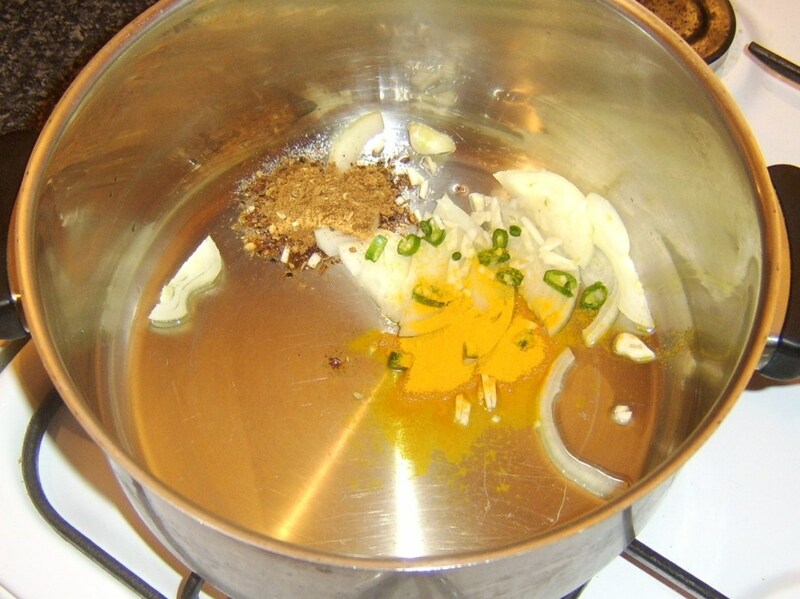 Bring the water to a boil and simmer for about twenty minutes or so until they are soft. 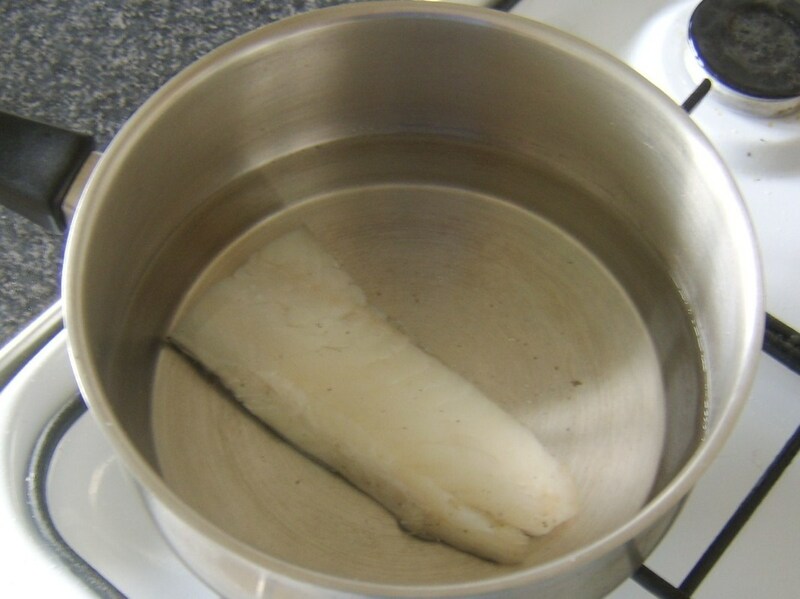 Put the pollack fillet in a separate pot of salted, cold water. 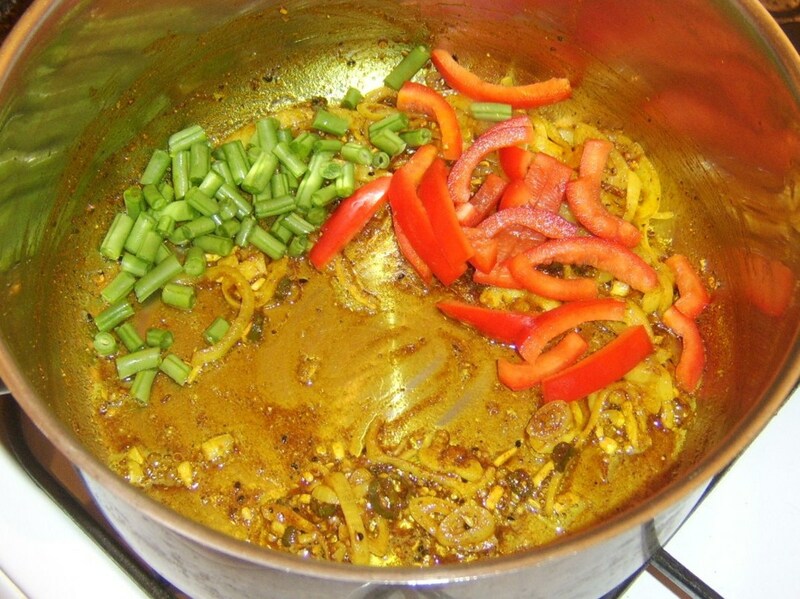 Put the pot on the heat and as soon as it reaches a simmer, lift the pollack to a plate with a large slotted spoon. Cover and leave to cool. 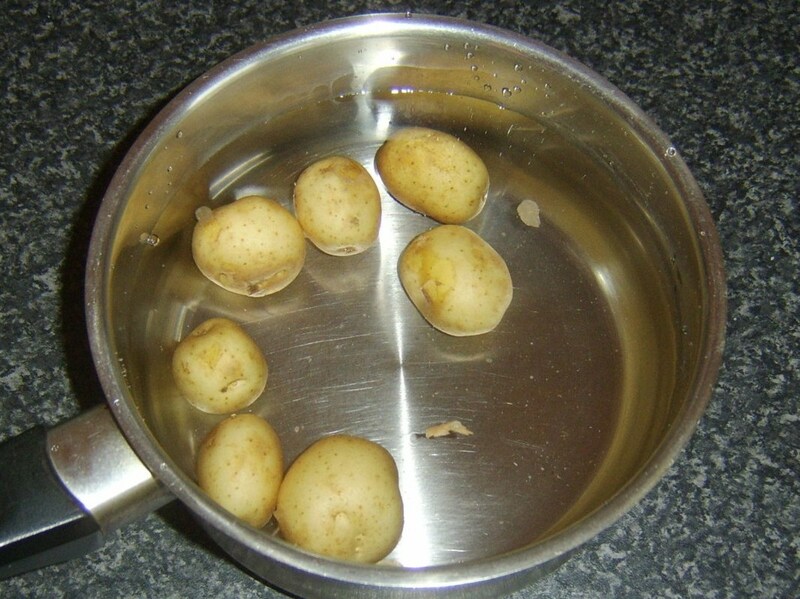 Drain the cooked potatoes and return to the pot. Leave for about ten minutes to steam off. This is essential to get rid of the excess moisture. Mash the potatoes. 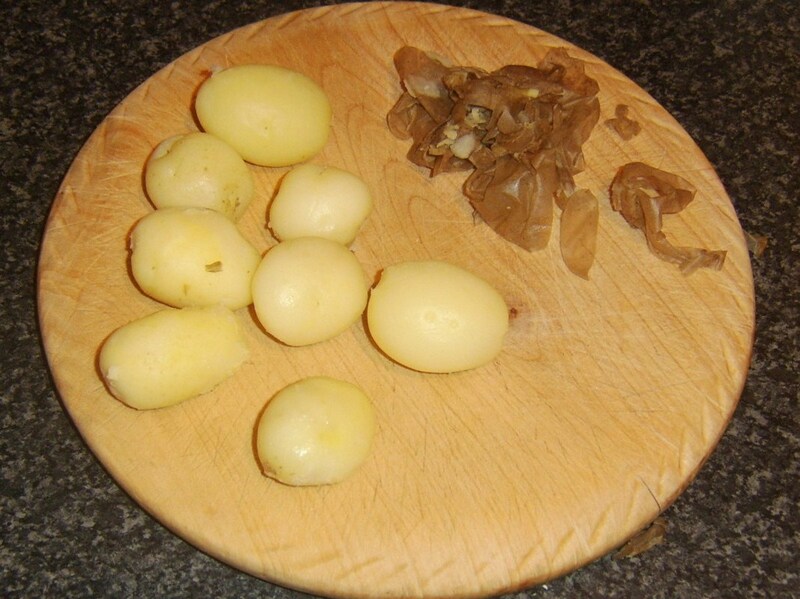 Flake the pollack flesh from the skin and add to the potatoes along with the garlic and chives. 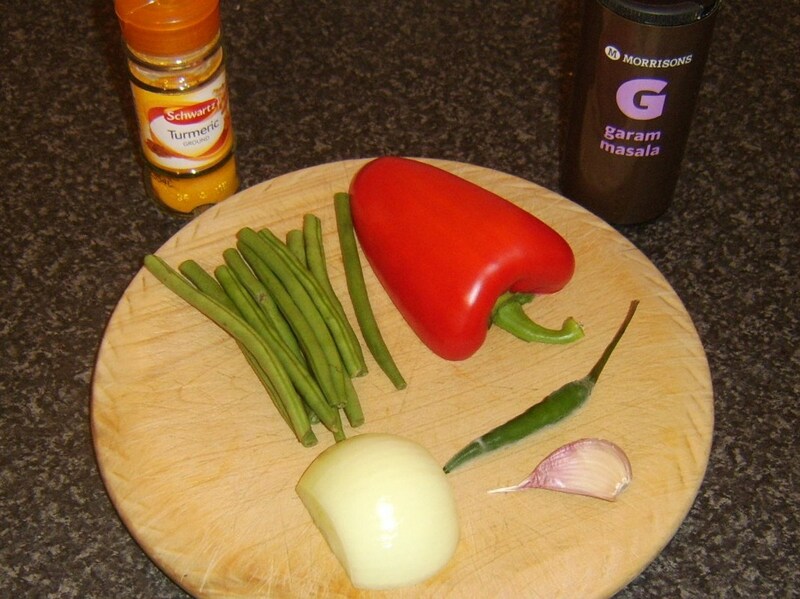 Season with salt and white pepper and stir carefully with a spoon to combine. 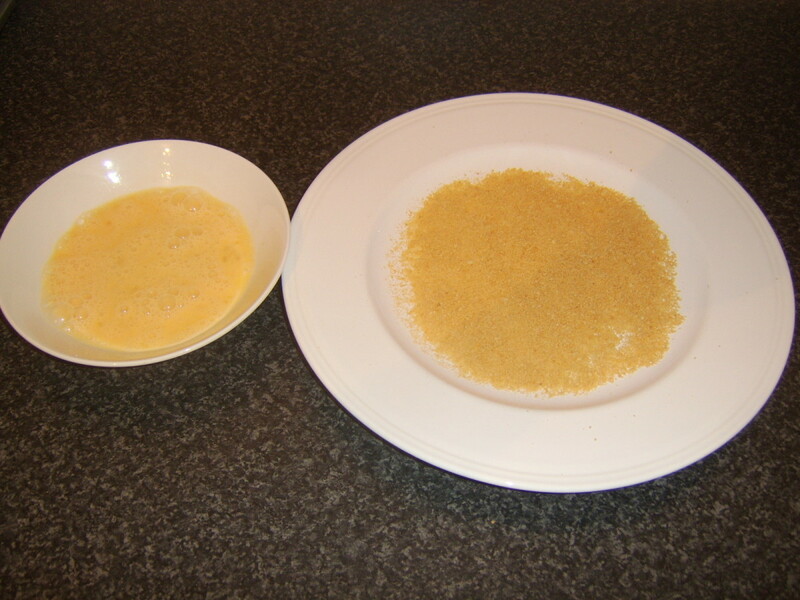 Divide the mixture in to two equal portions. Roll into balls and flatten between your palms in to patties. 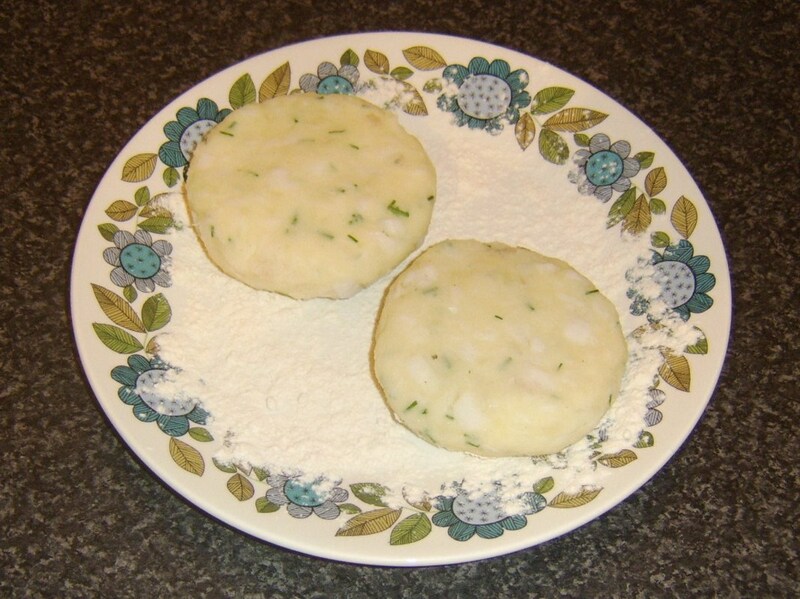 Pat in flour and lay on a plate. Refrigerate for one hour. 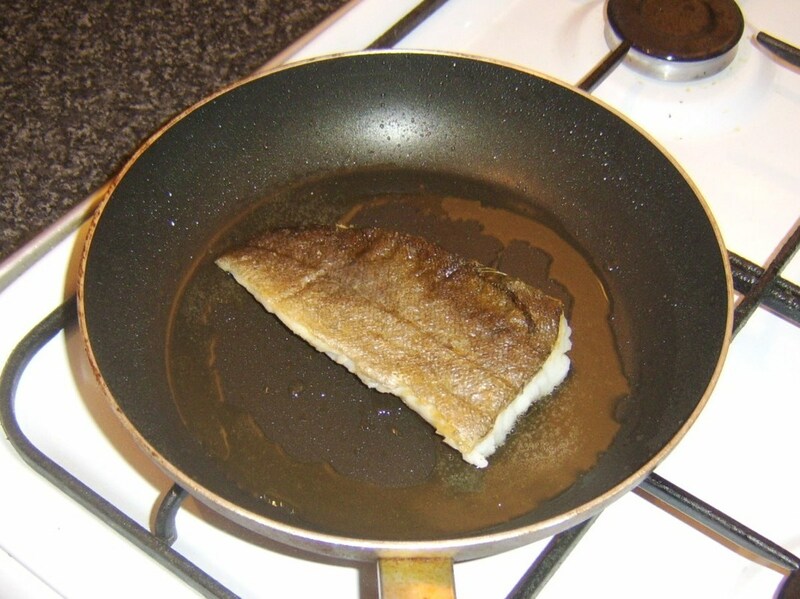 Bring a little oil up to a medium heat in a non-stick frying pan. 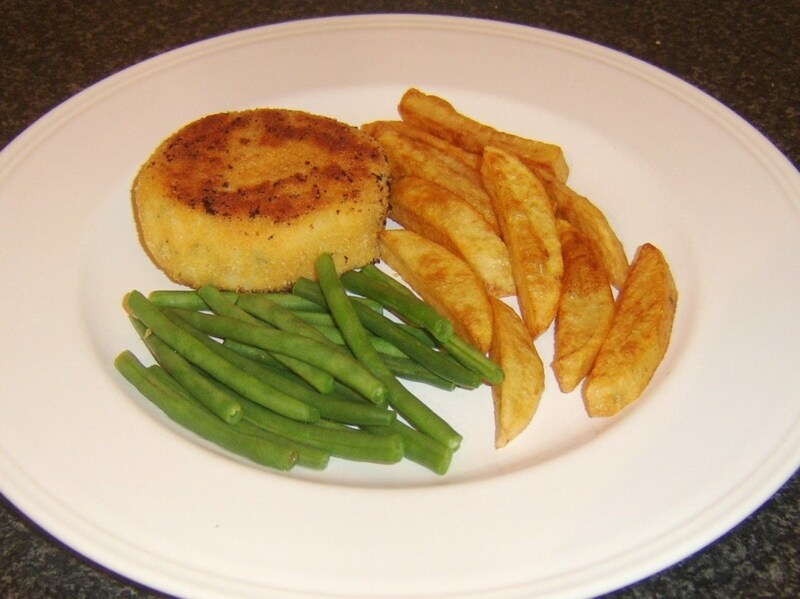 Dip the fishcakes in the beaten egg before patting on both sides, and around the edges, in the breadcrumbs. 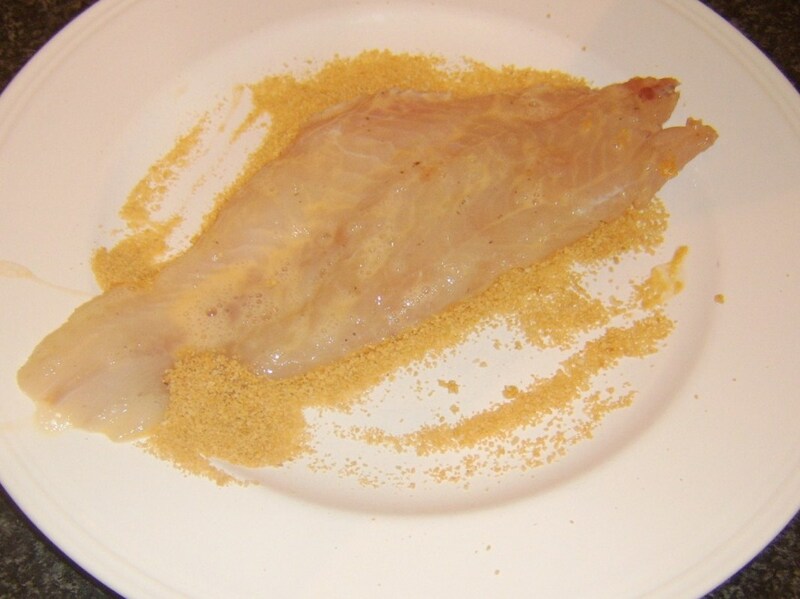 Fry for about eight minutes each side on a low to medium heat until the breadcrumbs are crisp and golden. 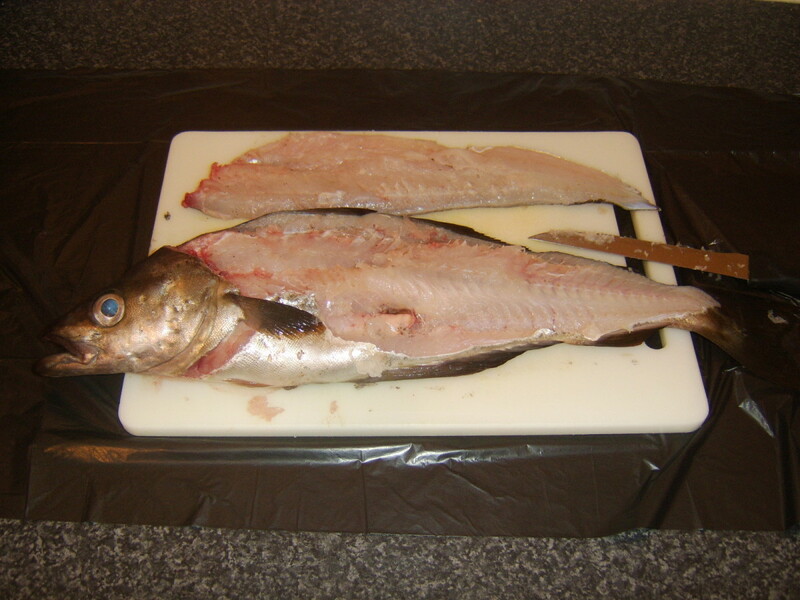 While filleting pollack can be a little bit tricky until you get used to it, there is nothing difficult about skinning the fillets. 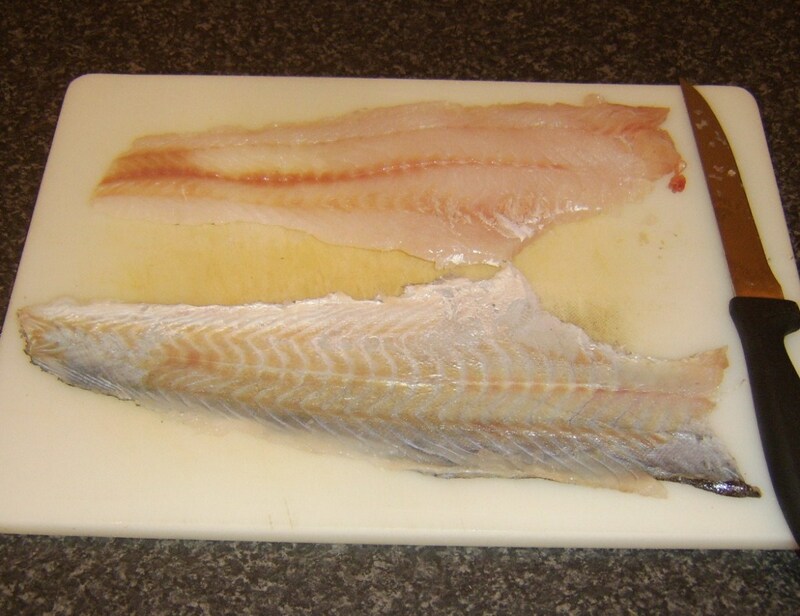 Lay the fillet skin-side down on a chopping board with the narrow tail end away from your dominant hand. 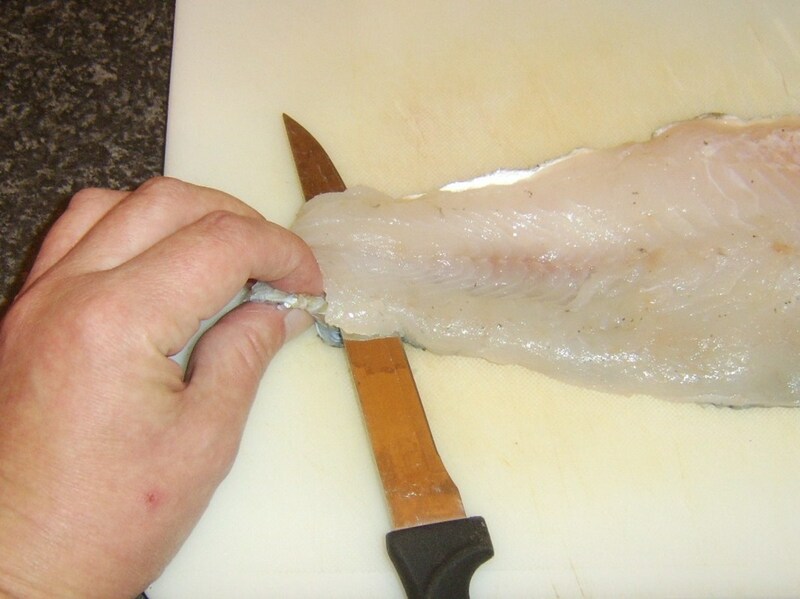 Pinch the tail end of the fillet as close to the end as you can while making sure you have a good, tight grip. Make a nick with the filleting knife, through the flesh and down to the skin, at a forty-five degree angle—moving towards the head. Turn the knife until it is almost horizontal and slide it backwards and forwards as you pull gently but steadily on the skin. 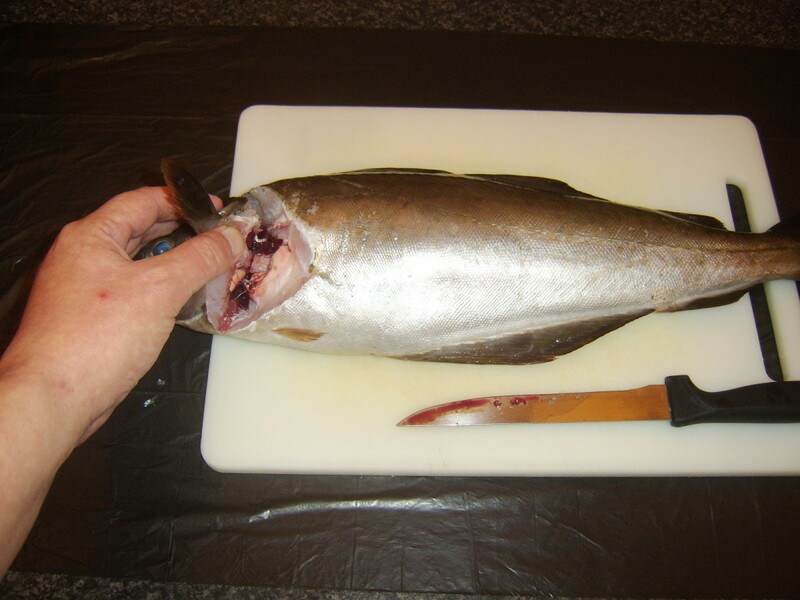 The knife should slide over the skin and cleanly remove the fillet. 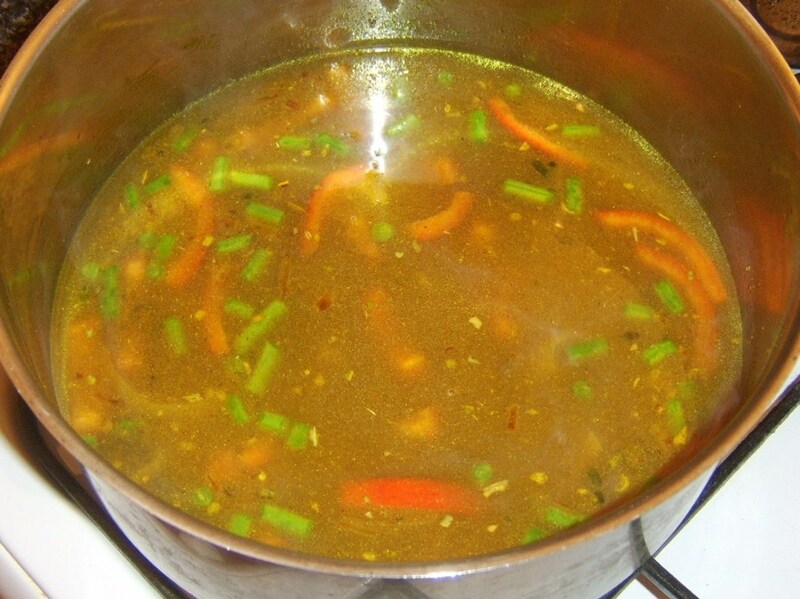 Put the vegetable oil in to a large soup pot and bring it up to a medium heat. 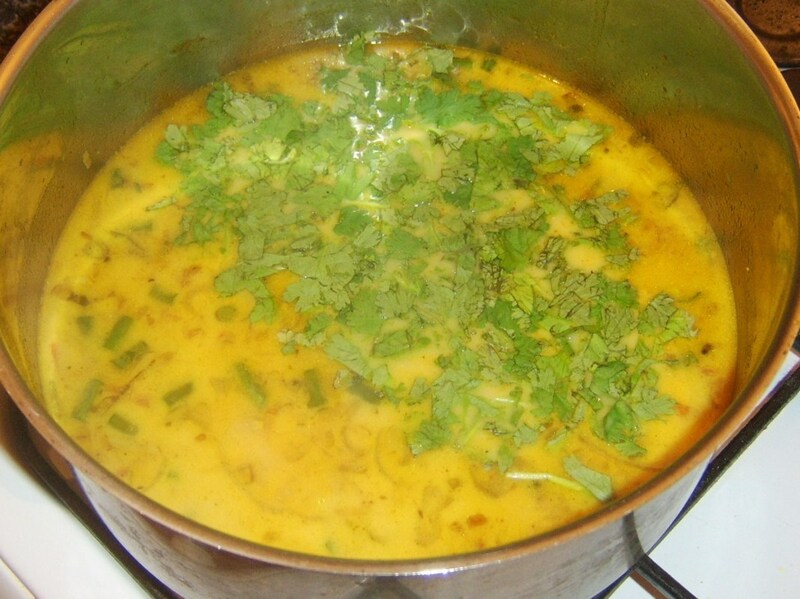 Add the onion, garlic, green chilli, garam masala, and turmeric. Stir fry gently for a couple of minutes until the onion is softened. 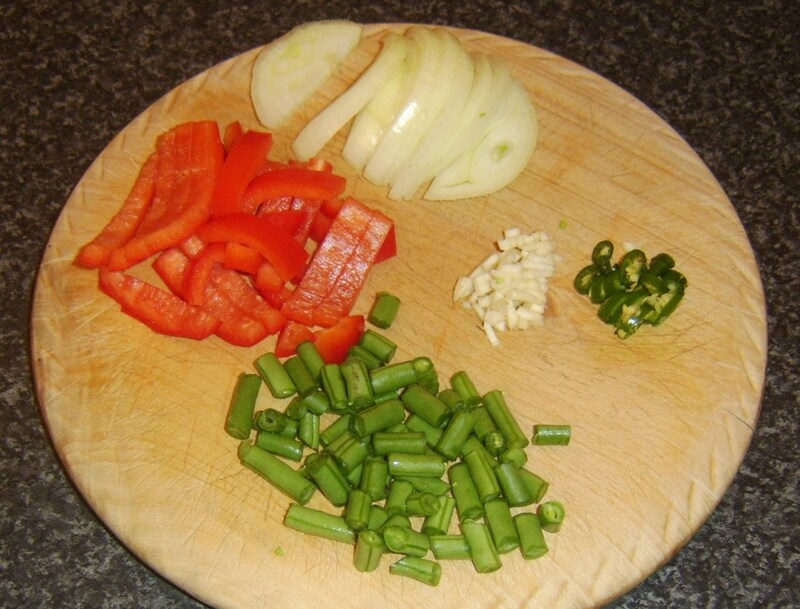 Add the red bell pepper and green beans and sautee for another couple of minutes. 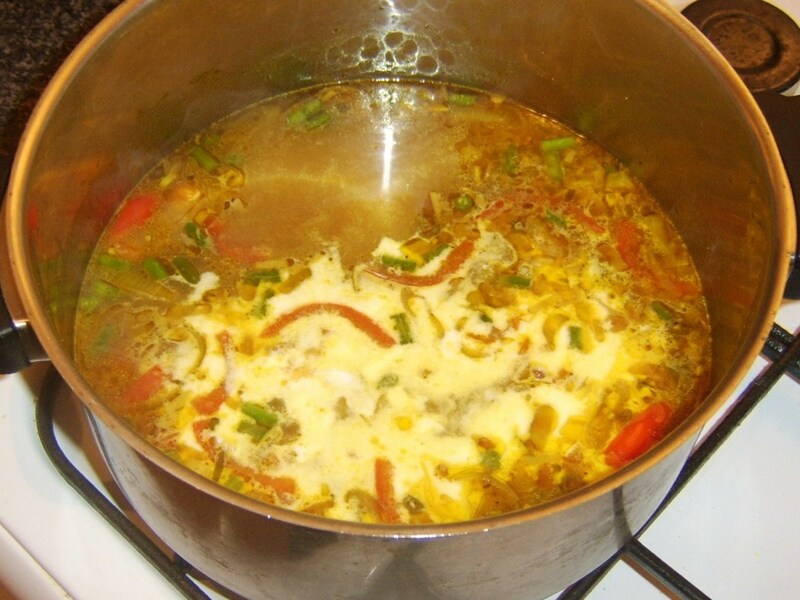 Pour in the fish stock, turn up the heat, and bring to a gentle simmer for ten minutes. Add the coconut cream to the pot and stir well. 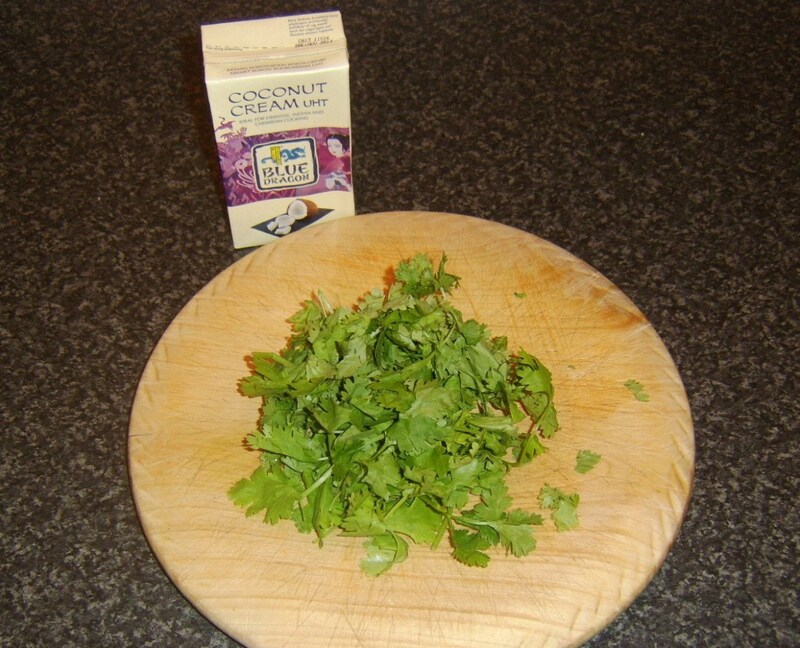 Add the pollack and coriander and bring back to a simmer. Then turn off the heat and leave for five minutes. 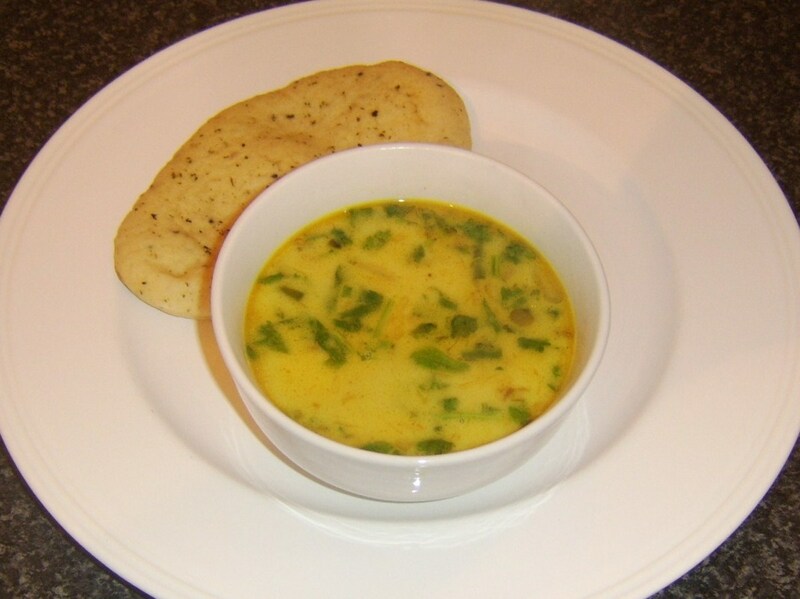 Serve the soup ladled into bowls with a mini naan bread accompaniment. 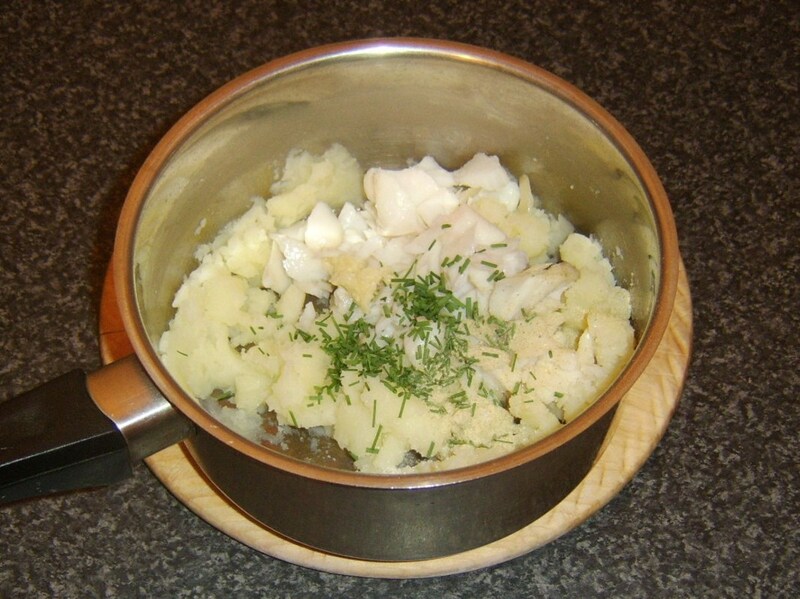 Simmer the unpeeled potatoes in salted water until just softened. Drain and leave for half an hour to cool. Peel the potatoes carefully with your fingers. 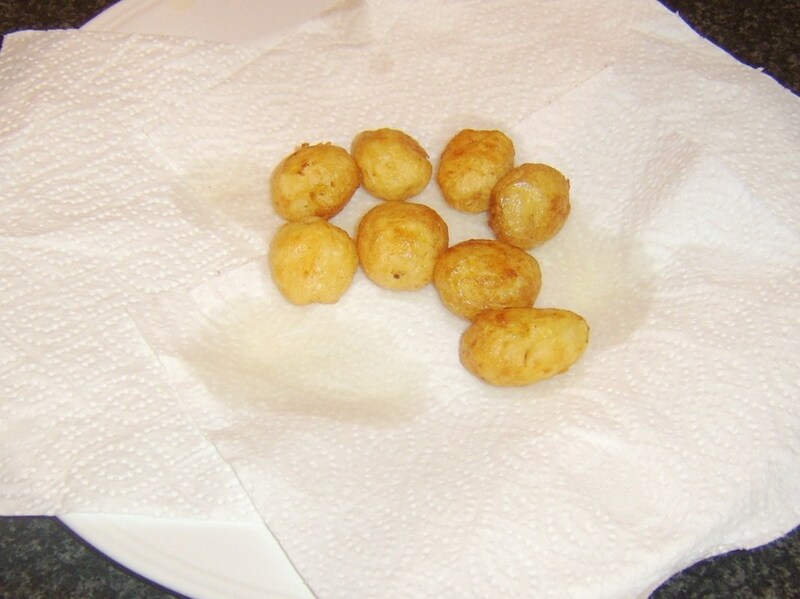 Deep fry the potatoes in a deep fryer, or deep frying pan, until crisp and golden. Drain on paper towels. 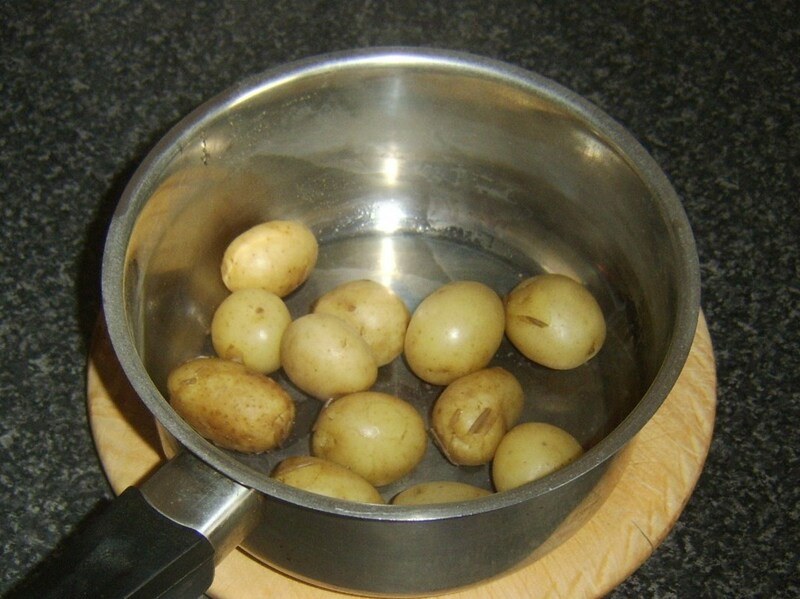 While the potatoes are frying, bring a little vegetable oil up to a medium heat in a frying pan. 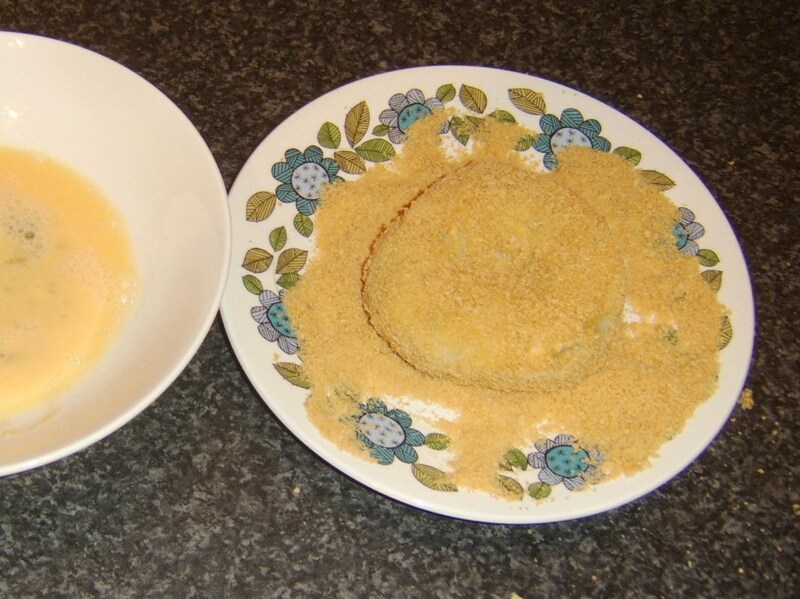 Dip the pollack fillet in the beaten egg before patting on both sides in the breadcrumbs. 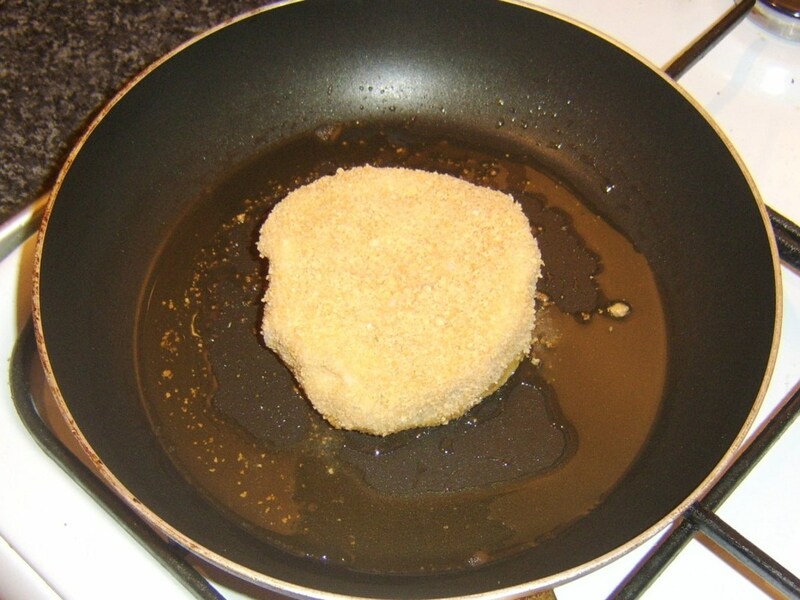 Fry on a medium heat for two or three minutes each side before briefly draining on kitchen paper. The frozen peas should be simmered in boiling water for three minutes before being drained. 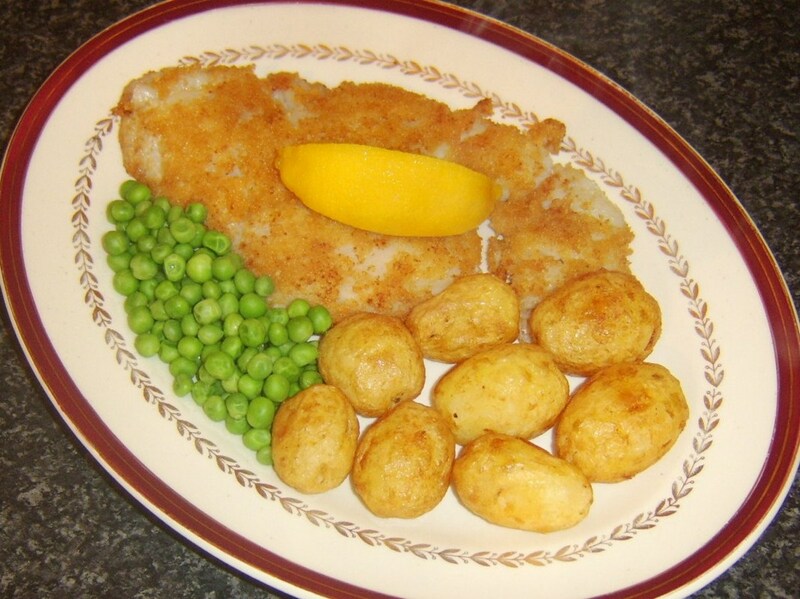 Plate the pollack fillet with the roast potatoes and spoon the peas alongside. Garnish with the wedge of lemon and season at the table. Thank you very much CharronsChatter. 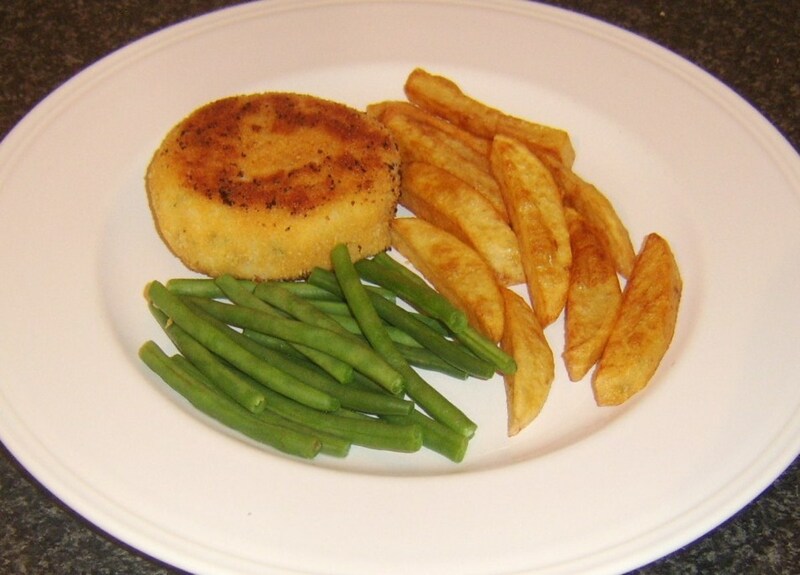 I hope the fishcakes at least are something you will get to try to that you enjoy them very much. wow wow WOW!! Amazing hub! I can't believe how many preps you have here, and all so cleanly presented, and the end product so appetizing. Those fish cakes have my interest, and my toque is sooOOOoo off to you! 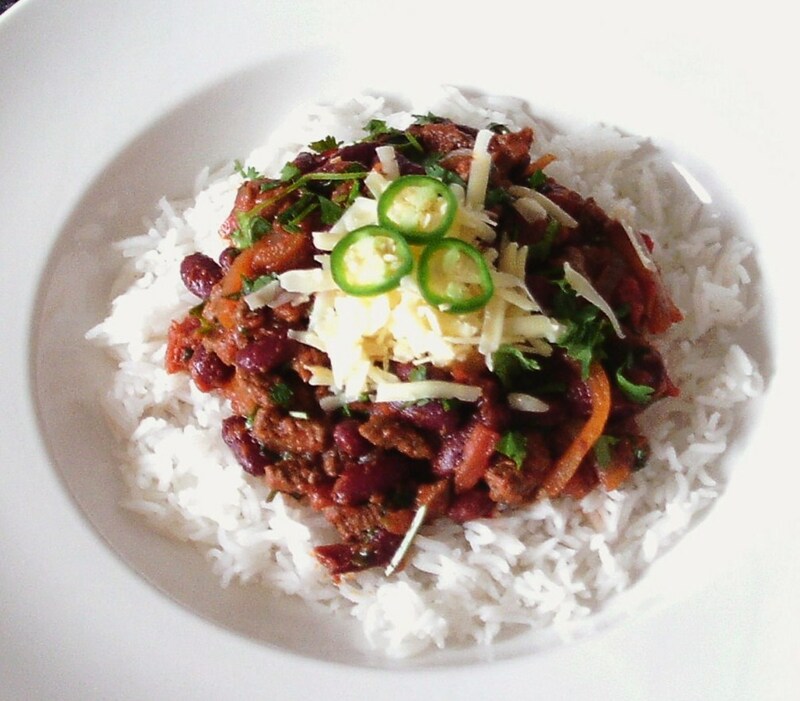 HI, Suzie HQ and thank you very much - Rick Stein is my food hero so to be compared to him is praise indeed :) I know there are some beautiful big pollack caught off the shores of Ireland but I'm not sure to what extent they are sold commercially. I hope you get a chance to try it soon - I'm sure you'd love it. Thank you randomcreative. As the page hopedfully shows, it is a very versatile fish and can be enjoyed in many different ways. Thanks tirelesstraveler. 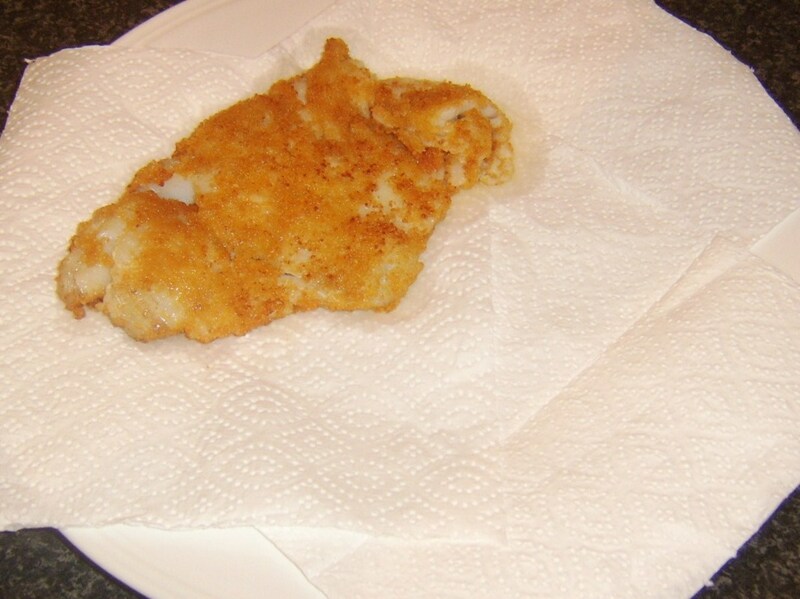 If you love white fish, you'll love pollack. Very meaty and tasty. Wow! This Pollack looks good. 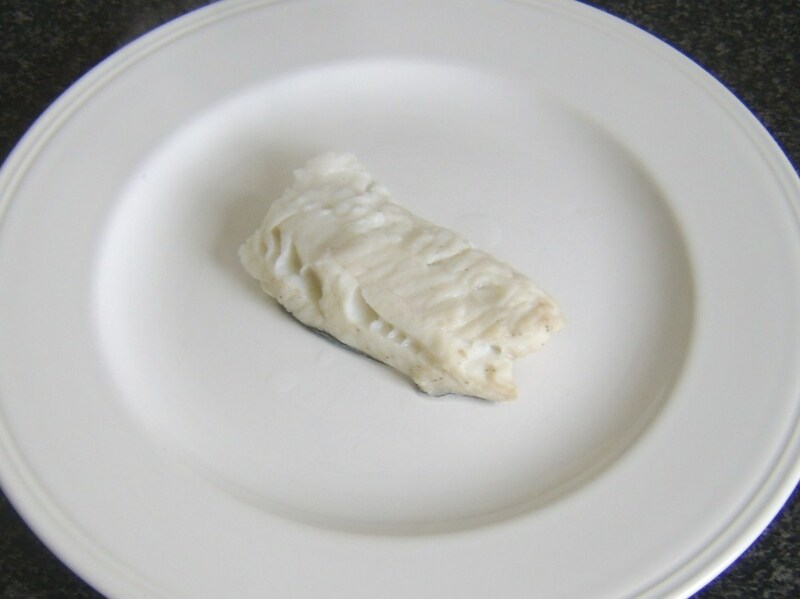 I love white fish. Great recipes. As always, there is something for everyone here! I love the detailed photos and instructions. Great job. Wow what another epic from you! 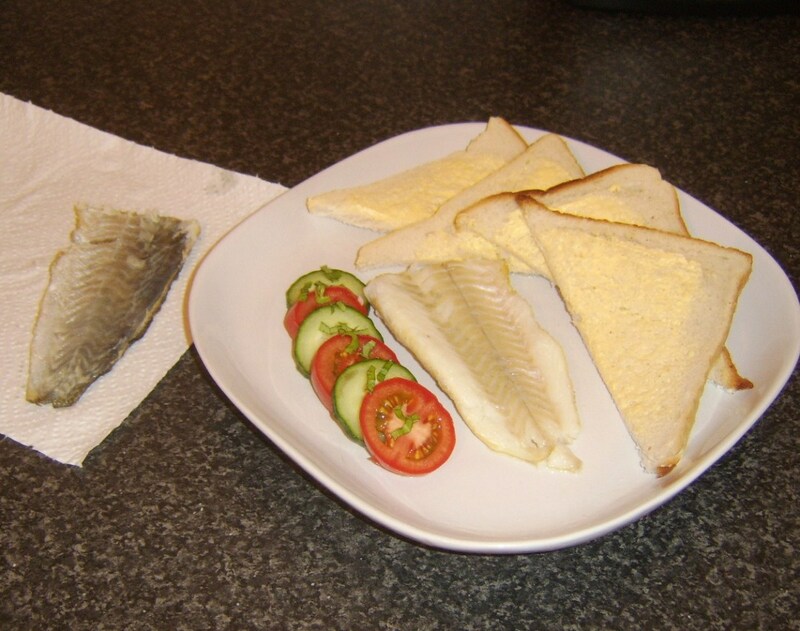 Scotland's answer to Rick Stein with filleting skills Michel Roux Jr would be proud of!! 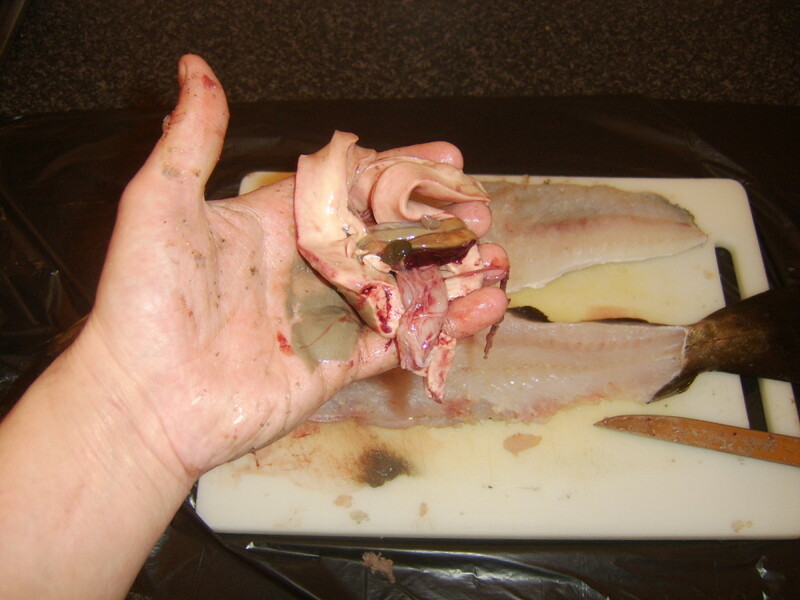 Fantastic fish filleting you do! Lovely recipes here, what a selection. 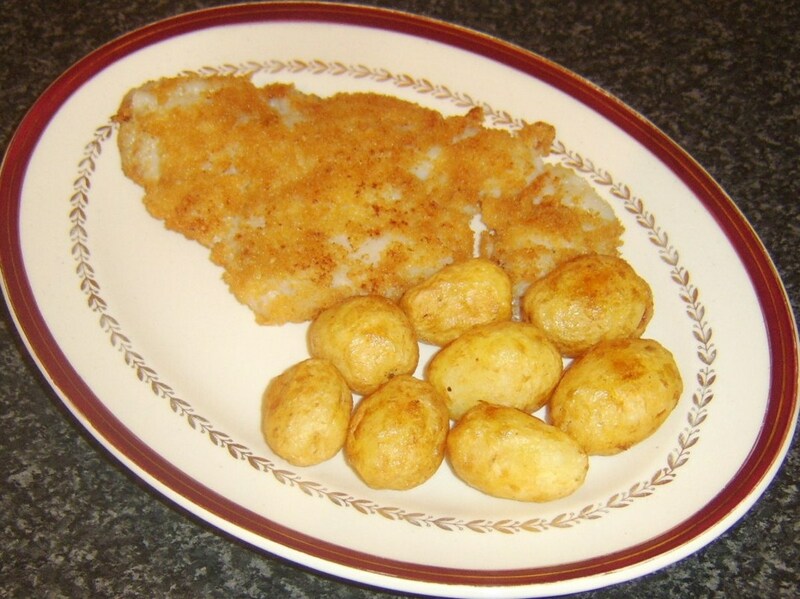 Great recipes I would love to try as pollack I have not had believe it or not and I love fish. Thanks for such a 5 star hub Gordon, votes ++++++ shared and pinned! !